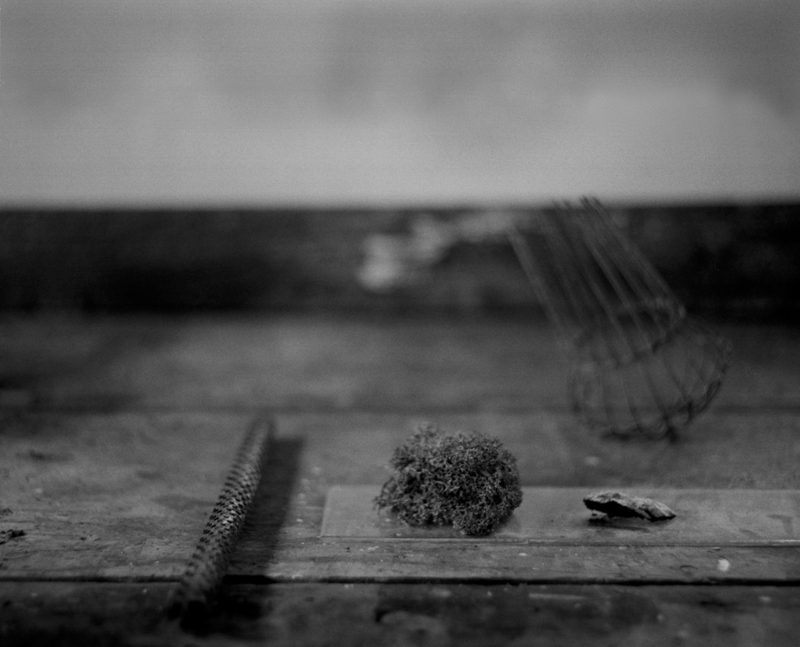 “Regarding Silences” is the culmination of eight years of research and production. 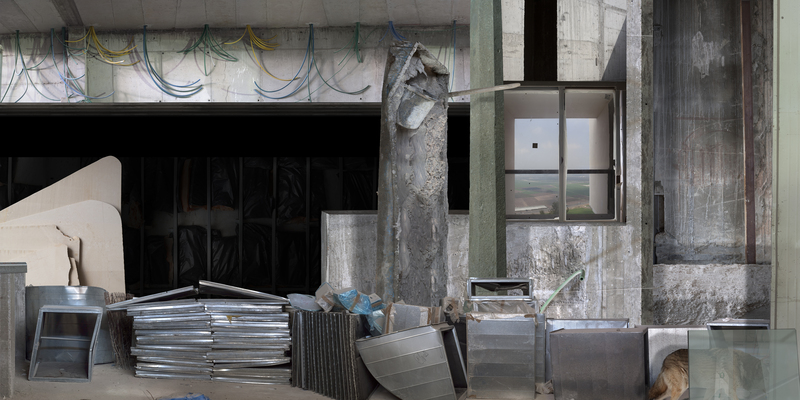 A series comprised of photographic panoramic works that focuses on the renovation of an emblematic Brutalist building designed by the architect Yaakov Rechter in 1968 and situated in the northern Israeli town of Zikhron Ya’akov. The building’s overhaul converted a subsidized convalescent home into a multidisciplinary art center and luxury hotel. Over the seven years of its renovation, Azoulay frequently visited this historical building, initially founded upon egalitarian principles and followed closely as it was turned into a luxury hotel and art center available exclusively to those who can afford it. This process reflects the transformation of Israel from a socialist state to a capitalist one. However, the project explores another transition: from war to post-war. In 1974, subsequent to the Yom Kippur War, the convalescent home was temporarily used by the Israeli army. Upon their return from Syria and Egypt, where they had been held captive, Israeli soldiers were interrogated on the site. They were asked various questions: Did they or did they not talk under torture? Had their actions put the state at risk? Had the general order of things been compromised? While some interrogations were straightforwardly verbal, about a third of the former prisoners of war (POWs) were taken to other sites and administered a special drug that caused them to mentally relive the moments of trauma they experienced during the war. The drugs not only forcibly made the soldiers re-enact these painful memories, but they had devastating lasting effects on these individuals until today. 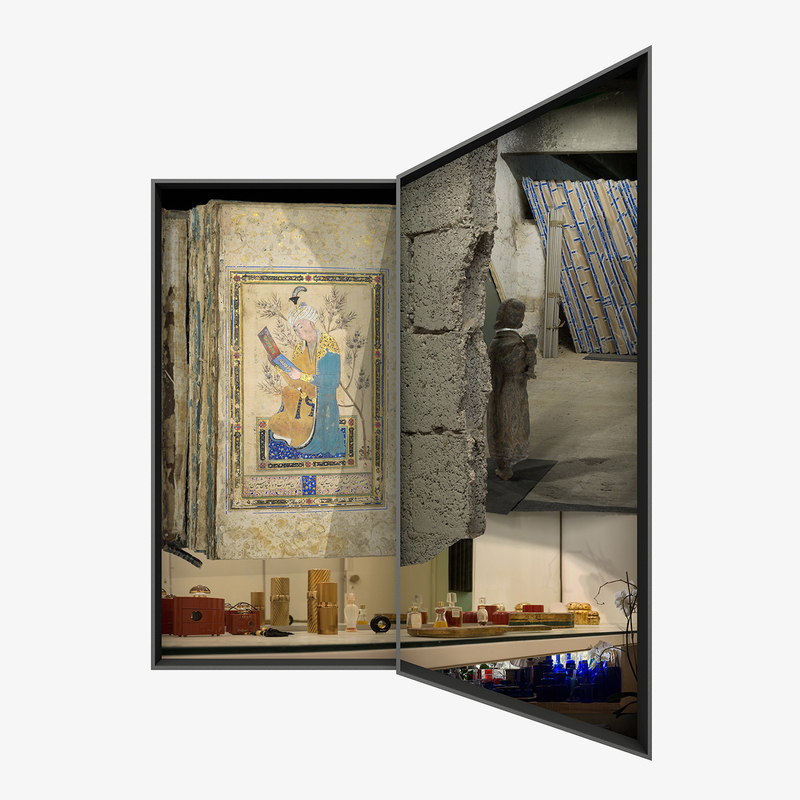 Over the course of the renovation, Azoulay meticulously photographed the building’s surfaces with a macro lens and created thousands of close-up images documenting the walls exposed during the reconstruction process, revealing their various past layers. 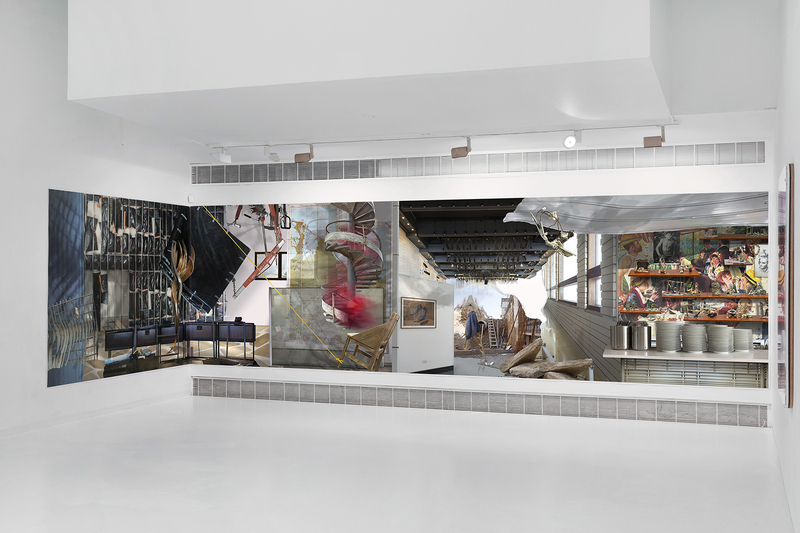 She then stitched these images together digitally to form a large-scale highresolution photograph, which she calls a “Photographic Plan,” presenting a multitude of angles. 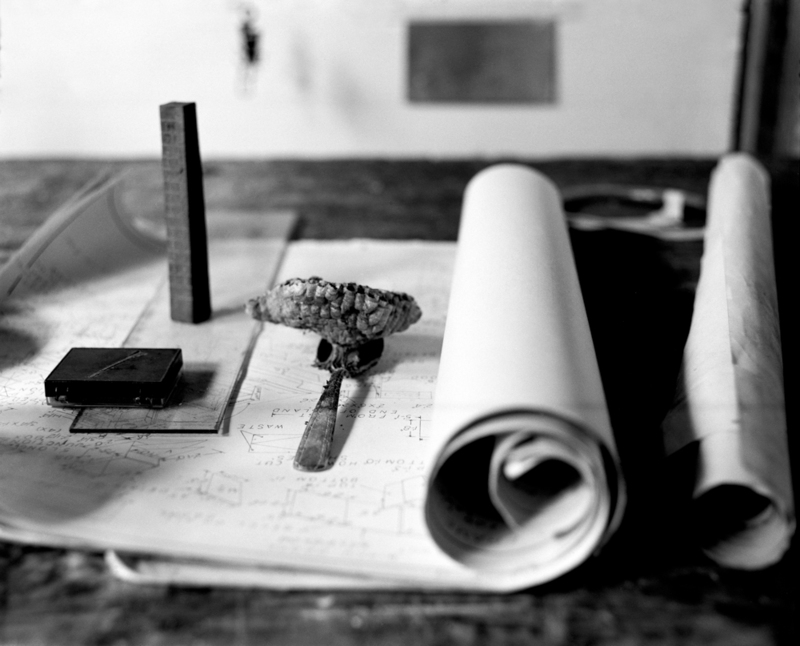 Due to the lack of sufficient documentation of some of the building’s historical events, Azoulay formed a research group comprised of an investigator, a linguist, a dramaturg, a psychologist writer, and the artist’s studio manager in order to create a fuller scope of view. They interviewed 43 witnesses and former POWs who had been held in the building in 1974. Interviews with a few of the figures this group met with are presented alongside the final works. 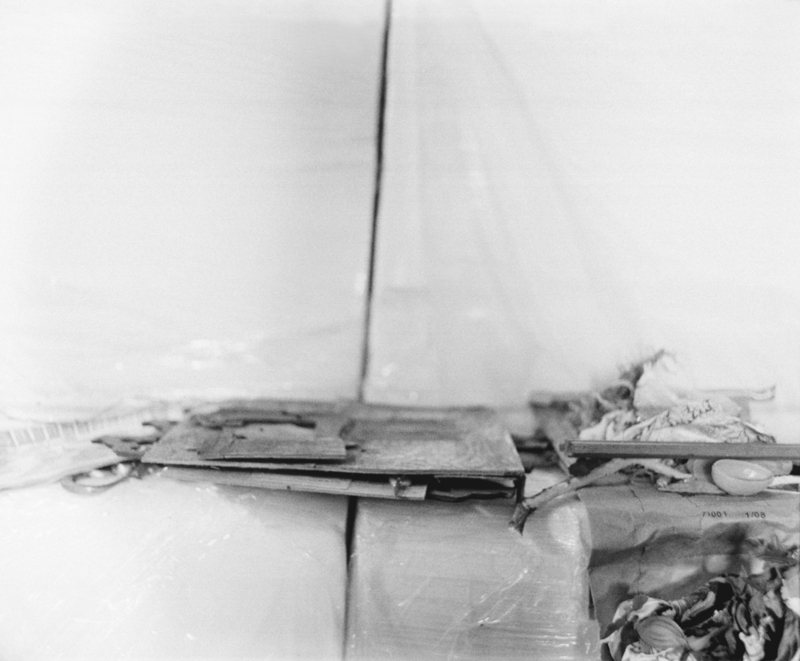 Materials the former POWs had kept or created, such as photographs, scrapbooks, handmade objects, etc. are featured throughout some of Azoulay’s works. They stand in for an experience that is hard to comprehend, one that is ultimately marked by silence — the silence of captivity, the silence of secrecy, and the silence of disengagement. The green represents a vacant non-space, a way of defining the almost unimaginable repressed memories and mental spheres into which some of the former POWs have sunk over years of silence. It is a parallel reality with no familiar landscape or daily routine, a dense bubble of simulation that can be dressed in any reality or landscape, but never become it. 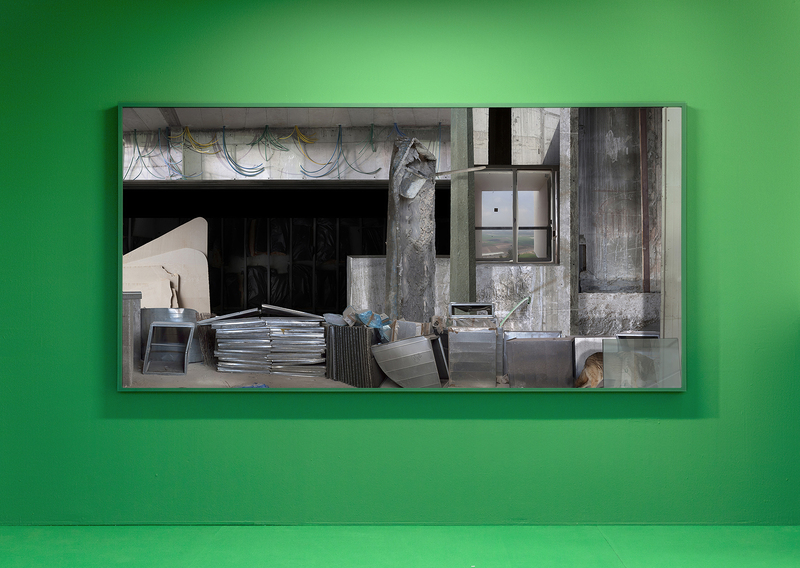 The Chroma key green also speaks to the photographic process which isolates details from the whole picture and places them within a new reality that has nothing to do with what the unaided eye would see. 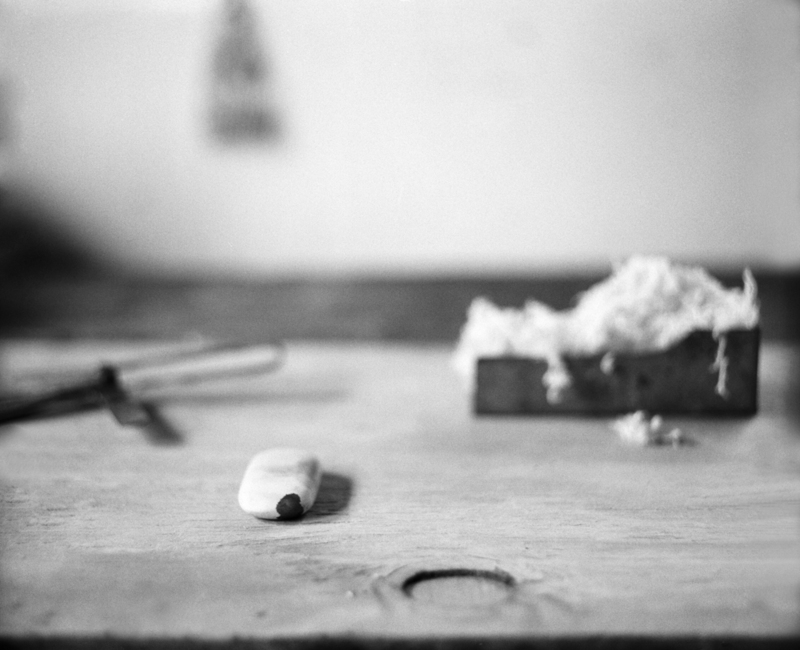 No element is simply found and, in fact, none of Azoulay’s works is photography in any straightforward sense of the term. 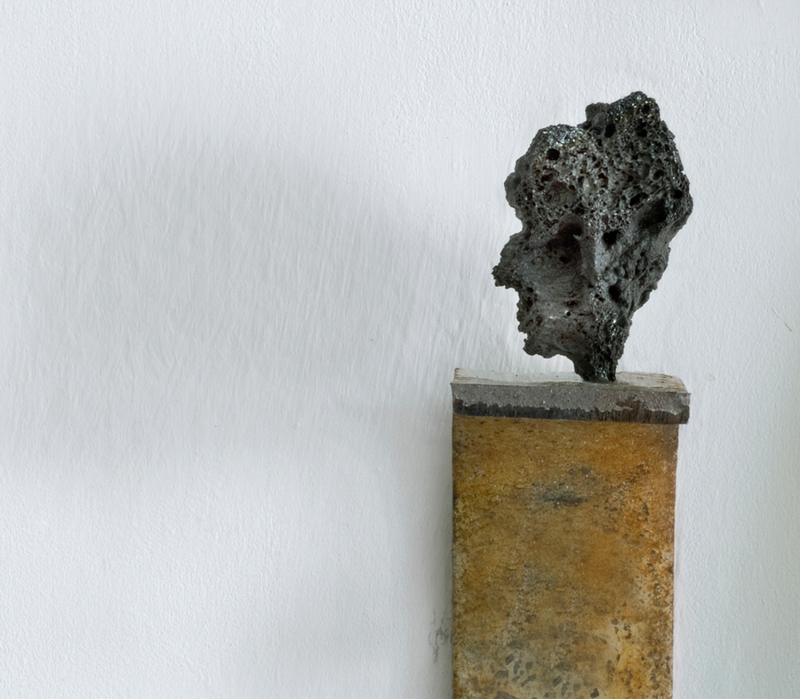 Each element in these highly constructed images, even the most banal looking piece of concrete or dust, is carefully considered and placed. 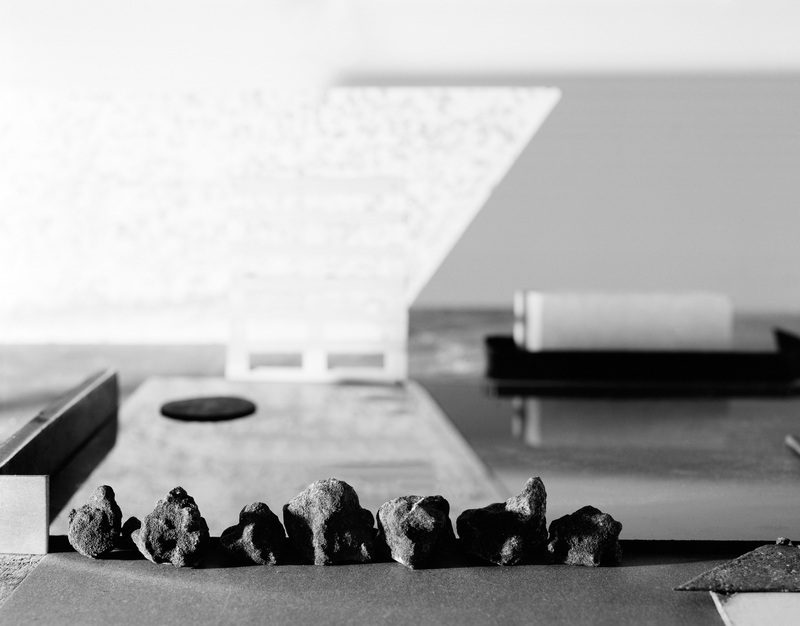 In the resulting project, the material history of a site intersects with the present in provocative and multifaceted ways. 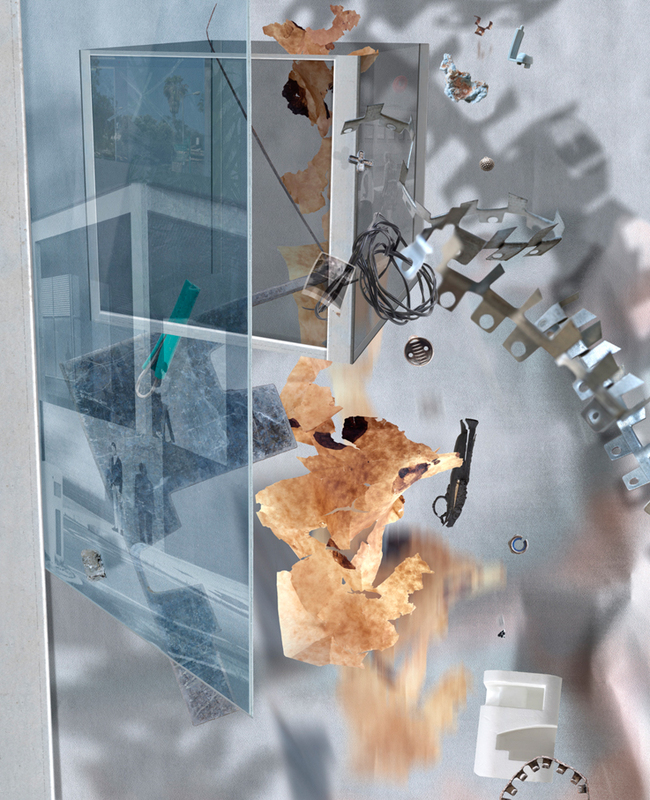 Intoxication of Oblivion, 2012, inkjet print, 142x288 cm / 56x114 inch. 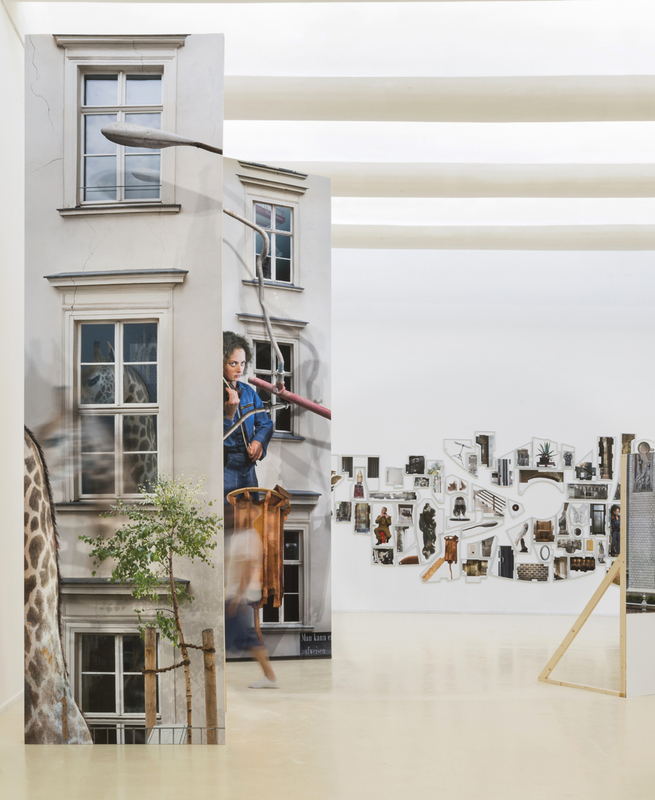 Howling for Beuys, 2014, inkjet print,150x300cm / 59 x 118 inch. 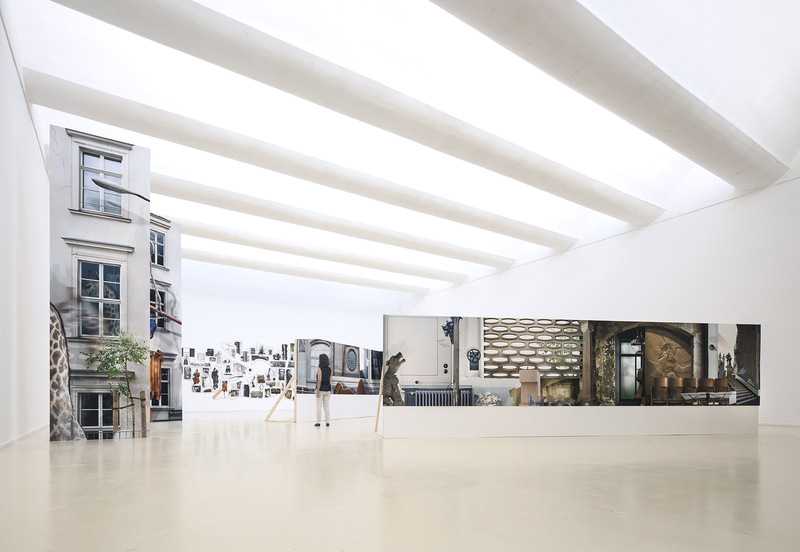 Regarding Silences, 2019, Installation view, The Center for Contemporary Art, Tel-Aviv. 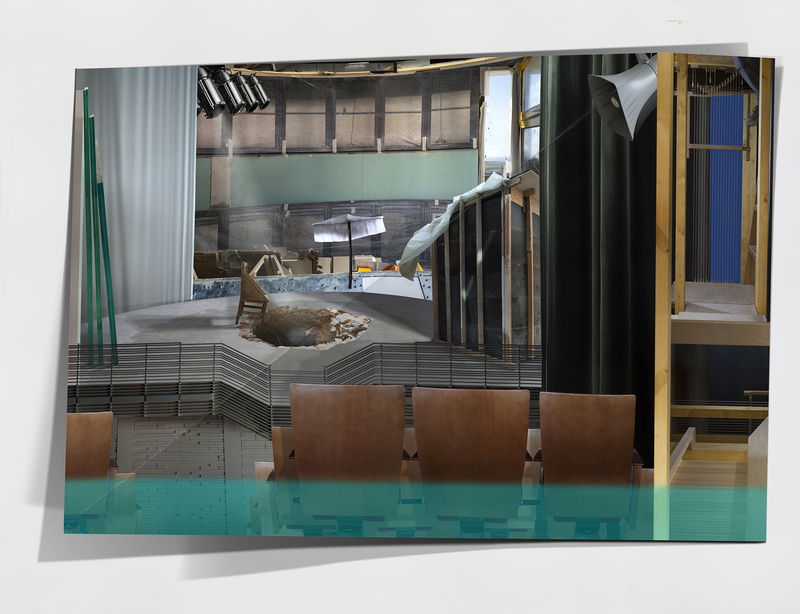 Mirror Stage, 2012, inkjet print, 144 x 288 cm / 56.5 x 113 inch. 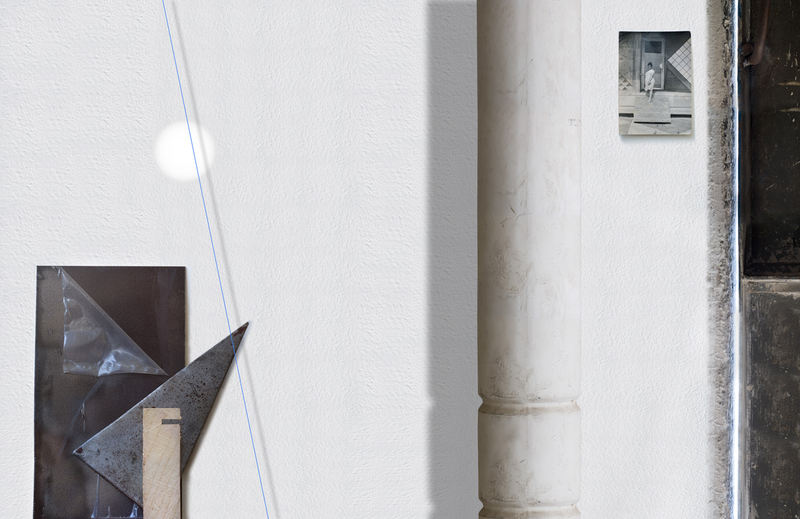 Imaginary Order, 2013, inkjet print, 150X440 cm / 59X173 inch. 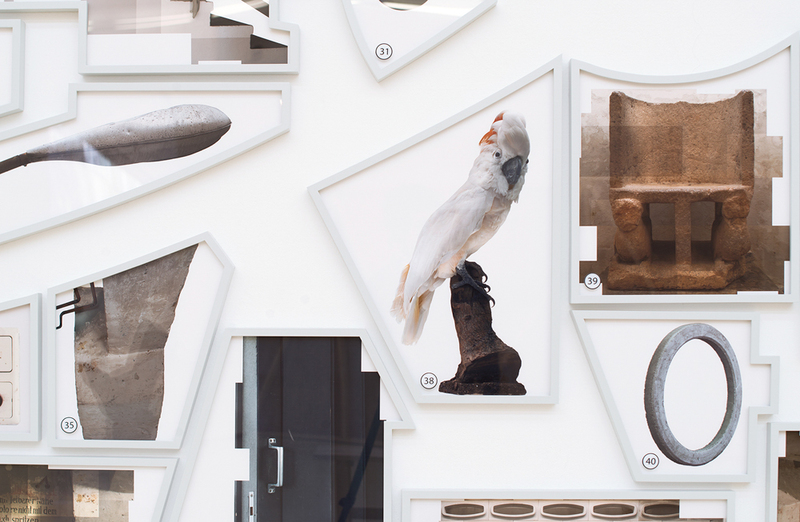 Ilit Azoulay 'No Thing Dies' arises from the depth of the Israel Museum in Jerusalem. The museum was erected in 1965 with the belief that it would help embed the cultural identity of the young state. 'No Thing dies' looks into the social layer that underruns this process for the past 52 years and perhaps shows how it sustains the illusion of a dialogue with 'the other' Middle-Eastern cultures. 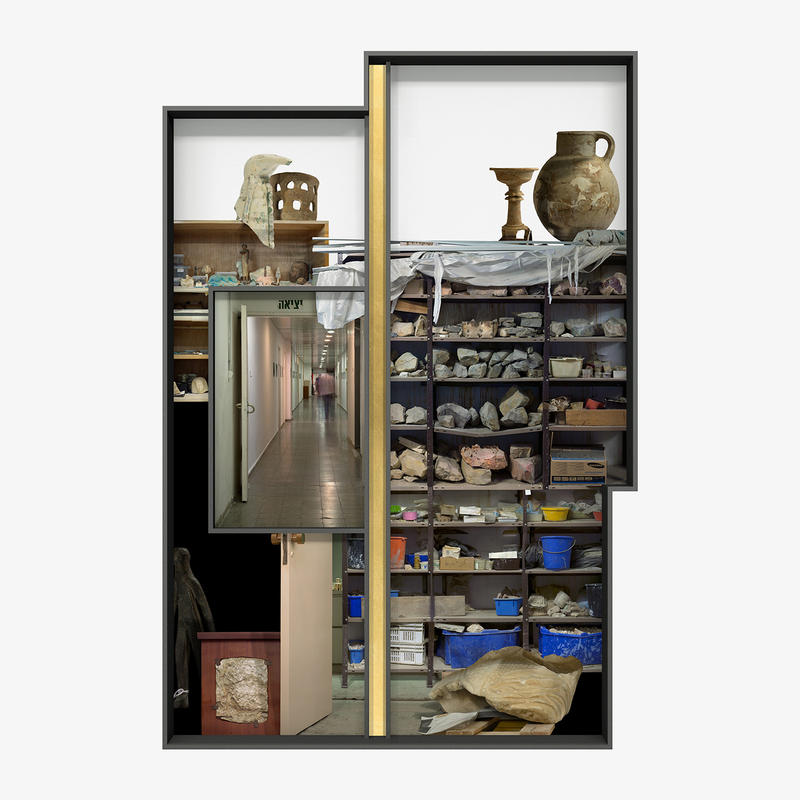 During three years, Azoulay spent most of her days in the storage rooms of the Israel Museum, reviewing its collections, and interviewing various curators, archivists and conservators. 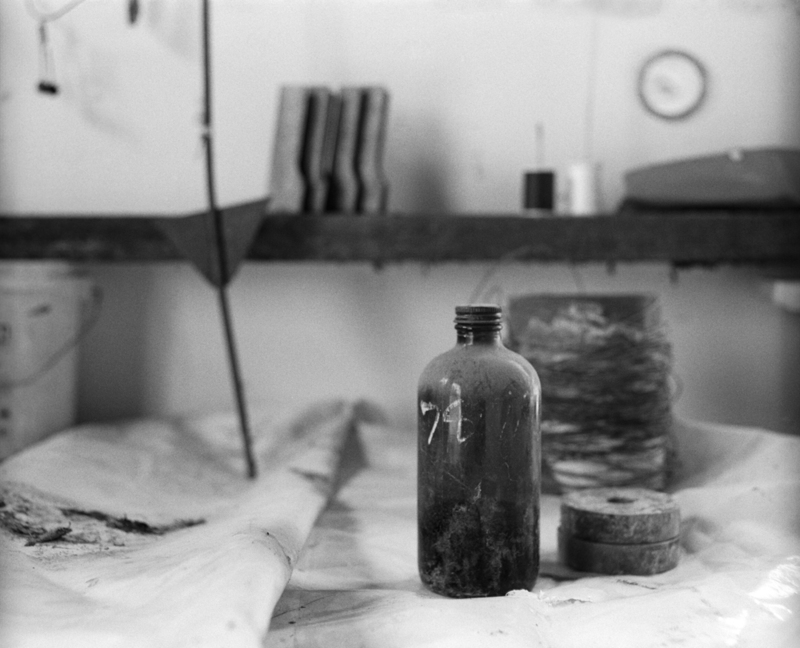 She recorded these conversations and slowly discovered the many artifacts that never were publicly exhibited, along with stories about their original purpose, their journey to the museum, and the challenges of their preservation and display. These stories revealed the deep involvement of the curators and conservators to every artifact of their collection. 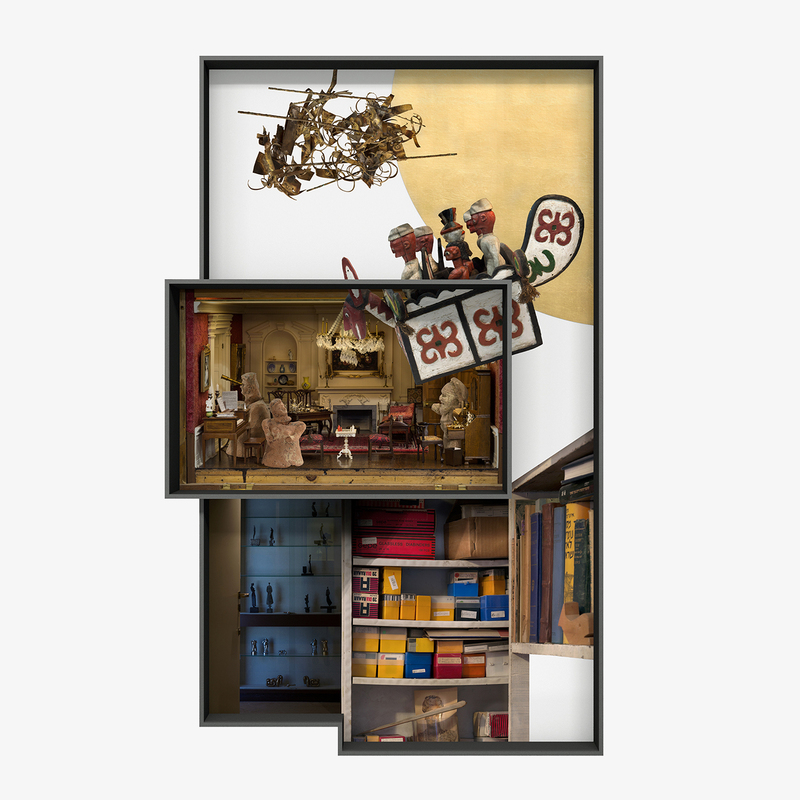 The selected objects were photographed, analyzed, classified and eventually created an image bank which, to some extent, reflects the invisible life-long labor of those preserving, researching, restoring, archiving, etc. 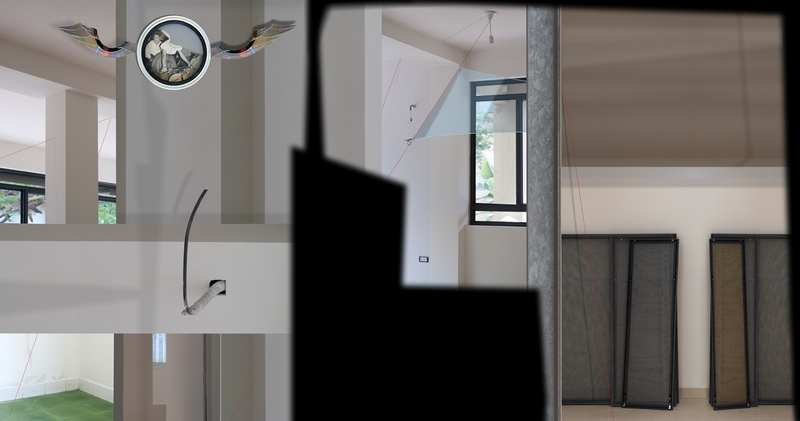 While recent surveillance technologies, similar to Azoulay's photographic technique, are working at narrowing the gap between image and data, Azoulay's composite images are instead re-inserting uncertainty, mystery, and complexity. 'No Thing Dies' draws inspiration from the tradition of Persian miniatures books that were ordered by the ruling monarchs and praised his name and deeds: a sort of early propaganda, taking place in salons and courts. 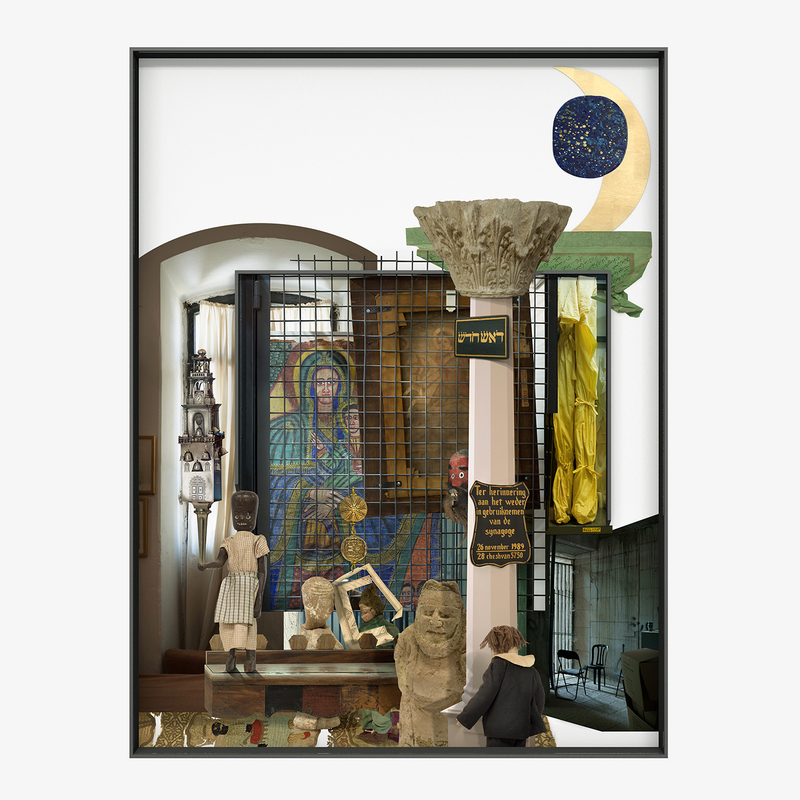 While her work too, was commissioned by the museum Azoulay's images, seem to create surreal and sometimes theatrical scenes stressing the duplicity of the Museum. 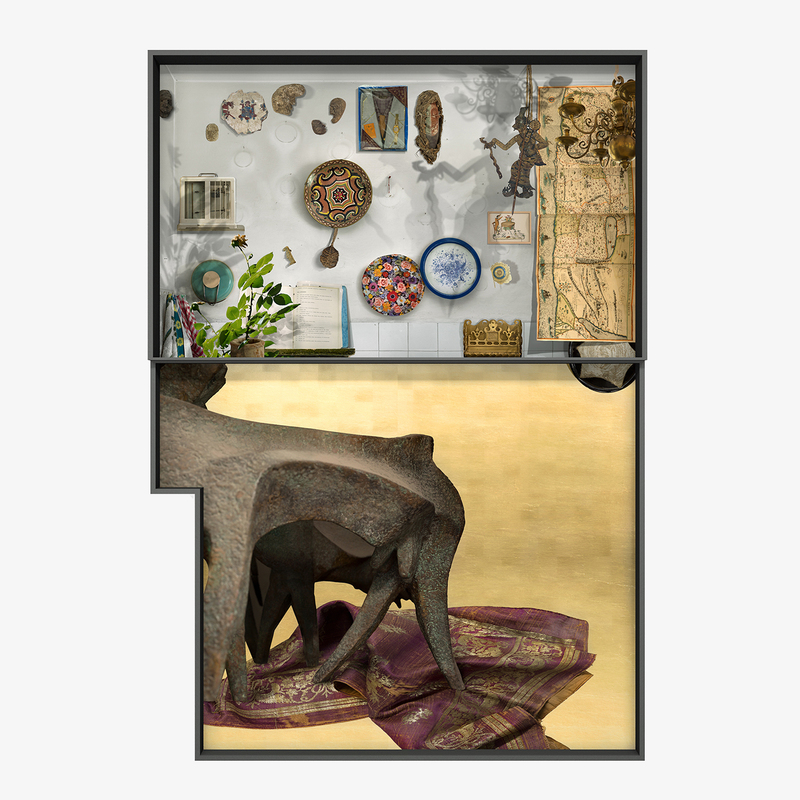 In early 2013, The Shpilman Institute for Photography, Tel Aviv, in collaboration with KW Institute for Contemporary Art and the schir Foundation, Berlin, announced Ilit Azoulay as the first recipient of their joint photography residency. 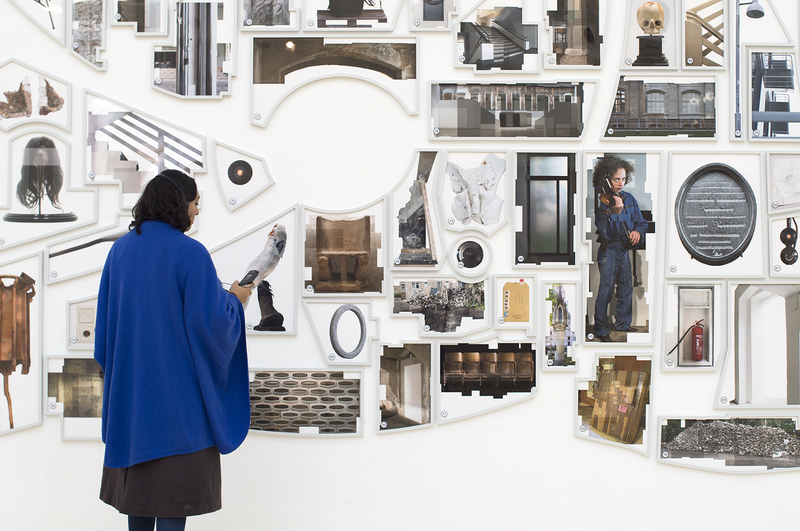 Azoulay moved into her studio at KW in June 2013 and used her five-month residency to develop her interest in the archeology of cities. 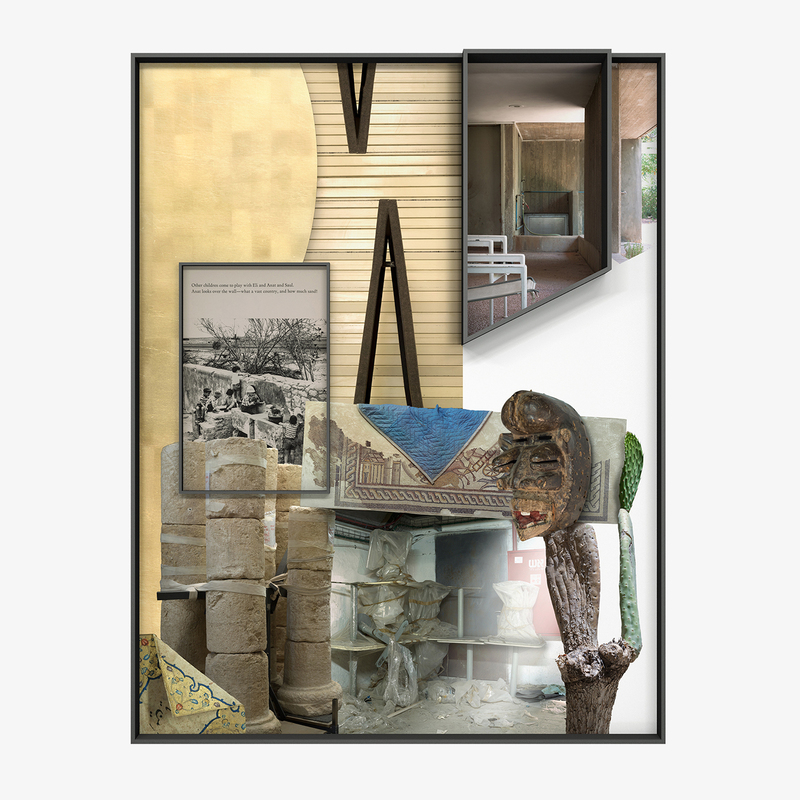 Azoulay traveled through Germany, collecting and photographing objects and architectural fragments in Berlin, Weimar, Kulmain, Regensburg, Dessau, Bamberg, Brandenburg, Xanten, Potsdam and Halle, as well as in the KW building itself. In some cases, she singled out sites undergoing preservation, while in others she examined buildings that were reconstructed precisely, brick for brick, in accordance with Germany’s restoration laws. She was fascinated by the special character of German preservation laws, archives, and public and governmental institutions as reflecting the country’s mechanisms of inscribing memory and history. Consequently, she undertook the collection of all possible information pertaining to the origin of each and every one of these objects. This meticulous gathering of information became central to the artist’s project in Germany, Shifting Degrees of Certainty. 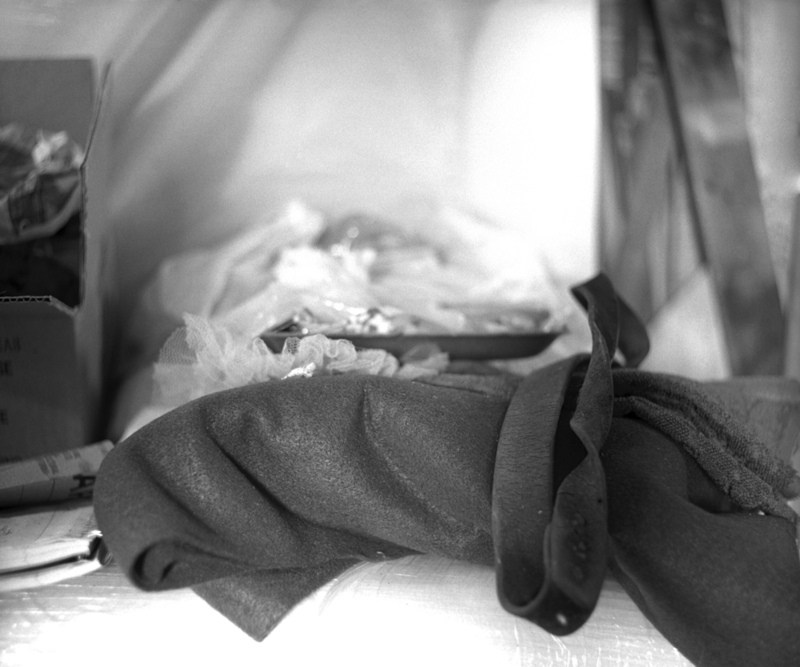 The final work is composed of 85 objects, which Azoulay photographed using a technique similar to scanning, and their stories. It also includes correspondence with monasteries, squat residents, taxidermy experts, plant researchers, building constructors, and lawyers. 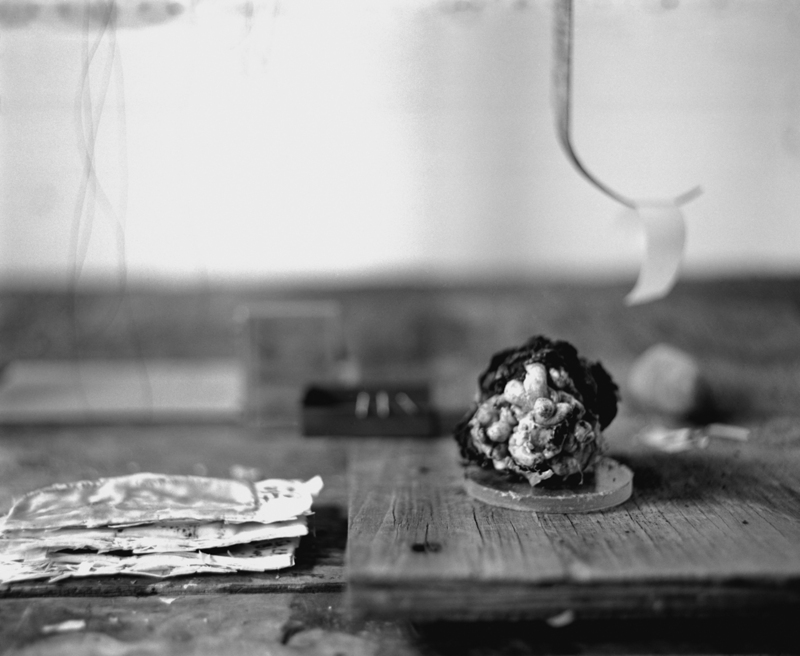 The photography technique used in this project is characteristic of Azoulay’s practice. 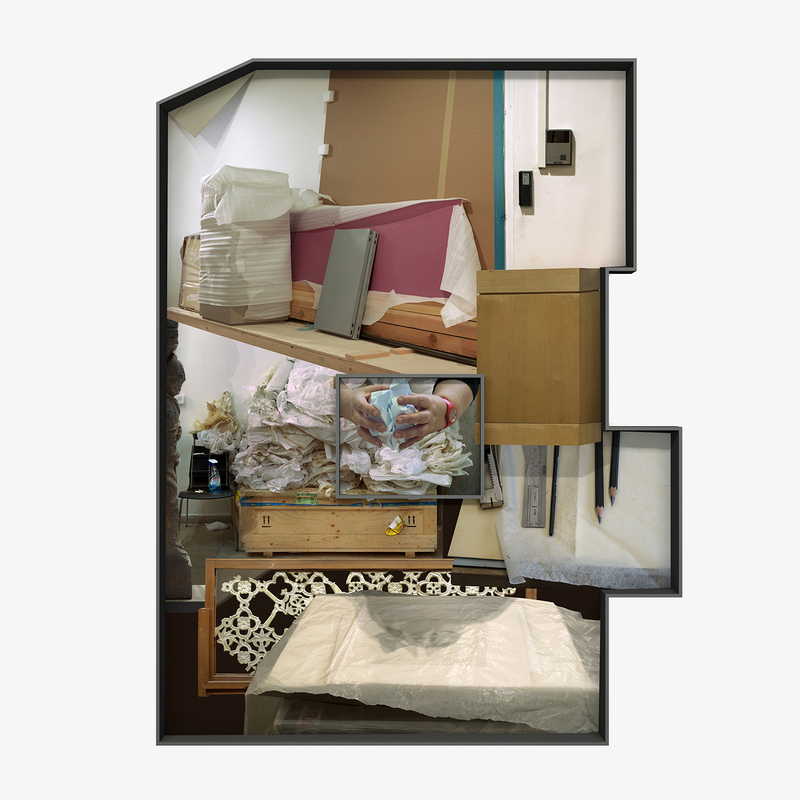 It allows her to juxtapose multiple points of view within a single, digitally composed image. The photographs are accompanied by a sound work which makes both the data gathered and the process of its collection available to the viewers, allowing them insight into the artist’s research process and the historical, personal, and idiosyncratic details it uncovered. 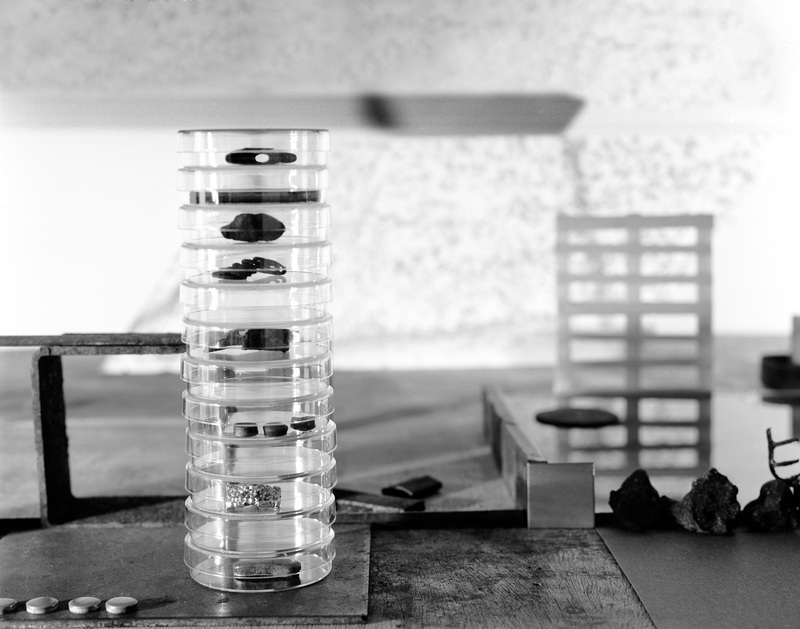 Unlike Azoulay’s previous research-based projects – a practice characteristic of her photographic oeuvre – here, the meticulous research behind each image is made part of the work. 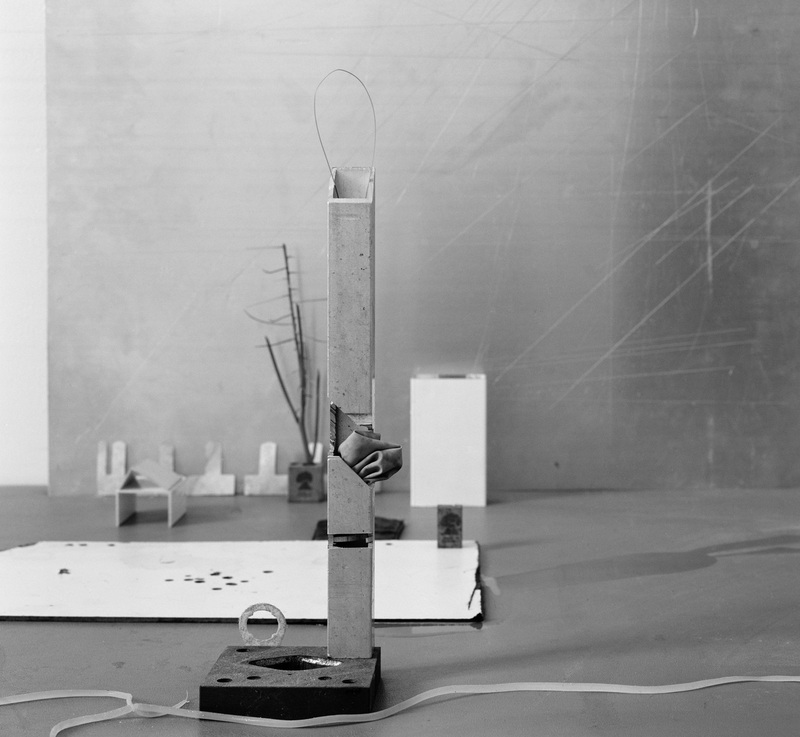 Consequently, what might seem, at first sight, to be an object-based work reveals itself, through the audio tracks that bring to life a process habitually left behind, as one in which the object is merely the starting point for questions regarding the construction of history and reality, as well as the production of memory and its mechanisms. 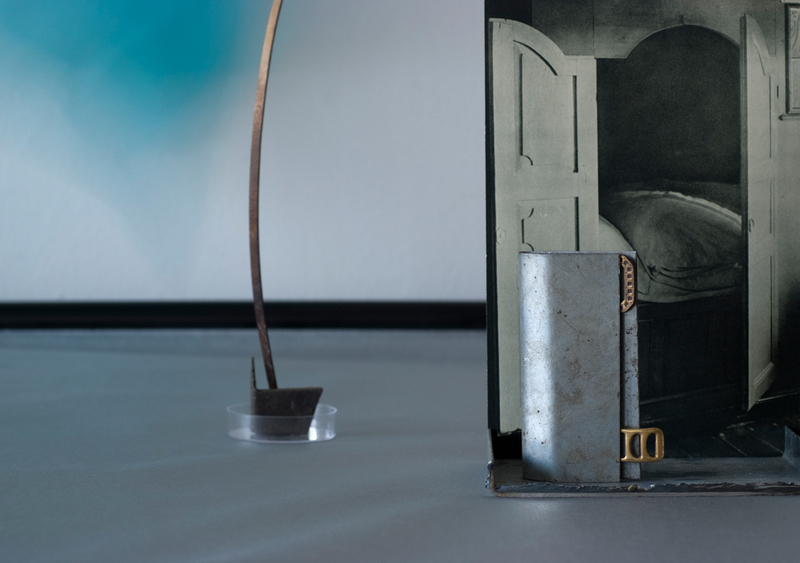 The presentation of the story as part of the work not only shifts the artistic focus away from the object itself, but also undercuts the certainty of a single perspective, and therefore of a single truth, which is pertinent both to reality and to the photographic medium. The soundtracks are available to the viewer via an audio-guide device, a traditional semi-didactic museum tool by which facts are often relayed in language typical of research. 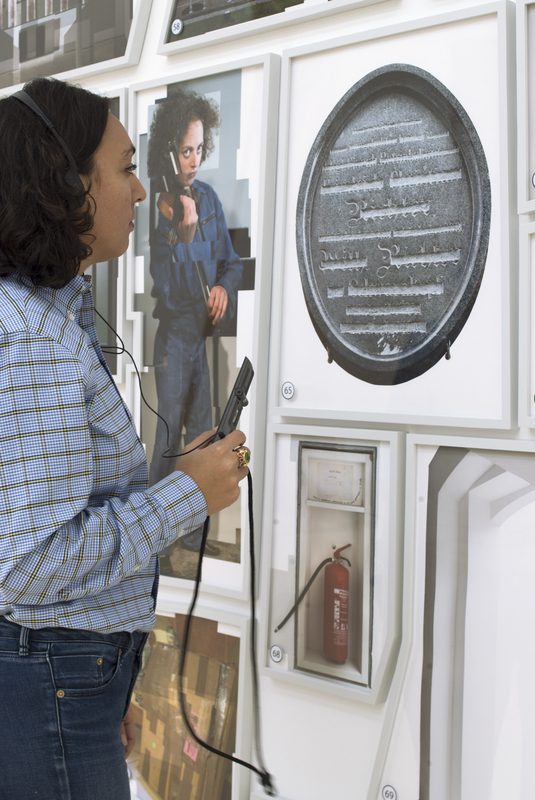 The information conveyed in Azoulay’s audio tracks encourages the visitors to observe the images, to focus on small details, to stare, to wonder. The stories told are not linear and do not offer a clear perspective. Listening to them, one becomes confused and distrustful. 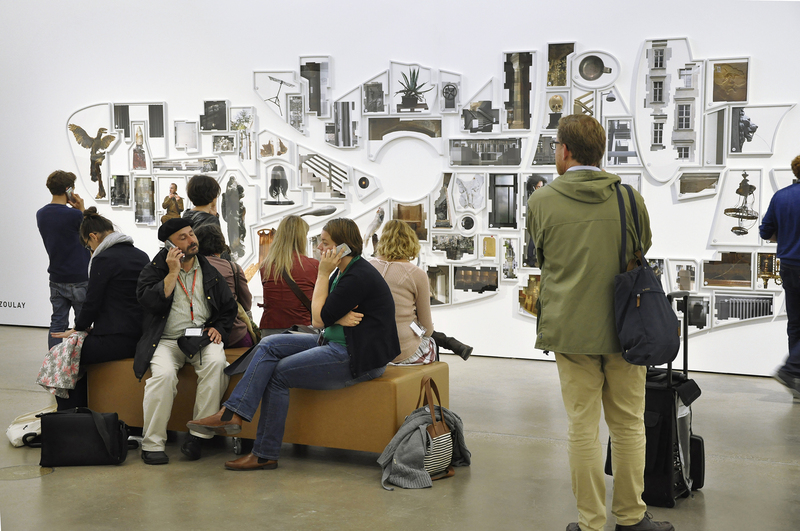 Consequently, one listens more attentively and commences one’s own investigation and inquiry into the images, the audio tracks, even the device itself – putting in question the very transmission of knowledge and the museum as an institution. The language of documentation employed by the soundtracks draws one’s attention to the ways by which history is constructed, determined, organized, and perhaps manipulated. 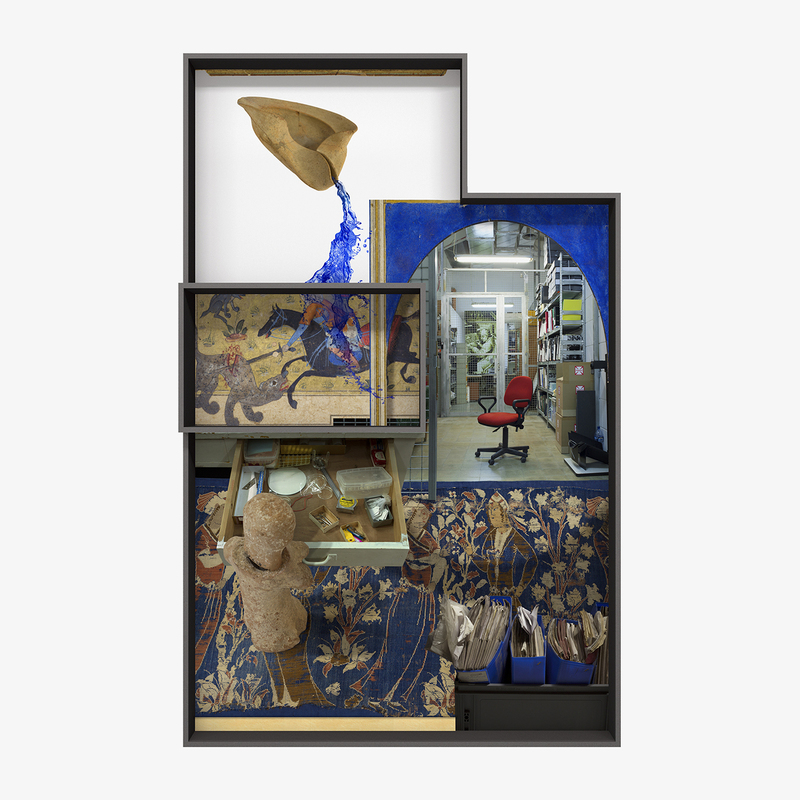 In her show presenting this project at the Herzliya Museum of Contemporary Art, the objects were presented as a theatrical set awaiting a situation or an event. 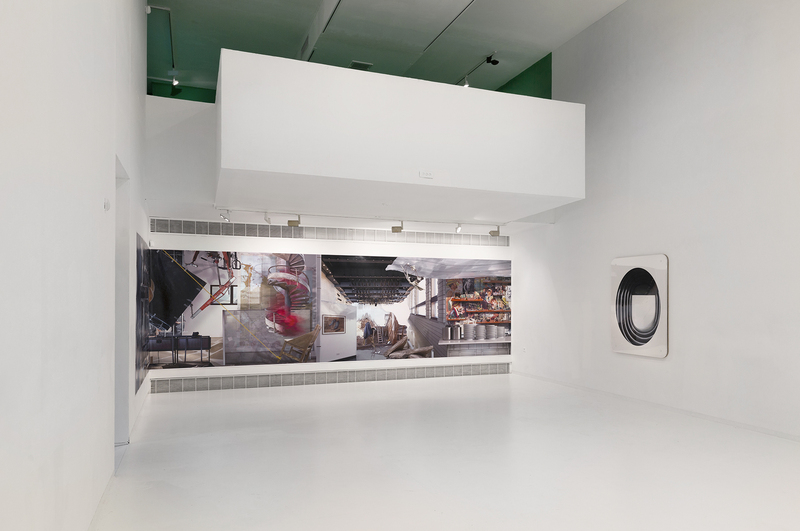 Arriving in the gallery, the large-scale panoramas of Shifting Degrees of Certainty hit the viewers with a sense of reality. 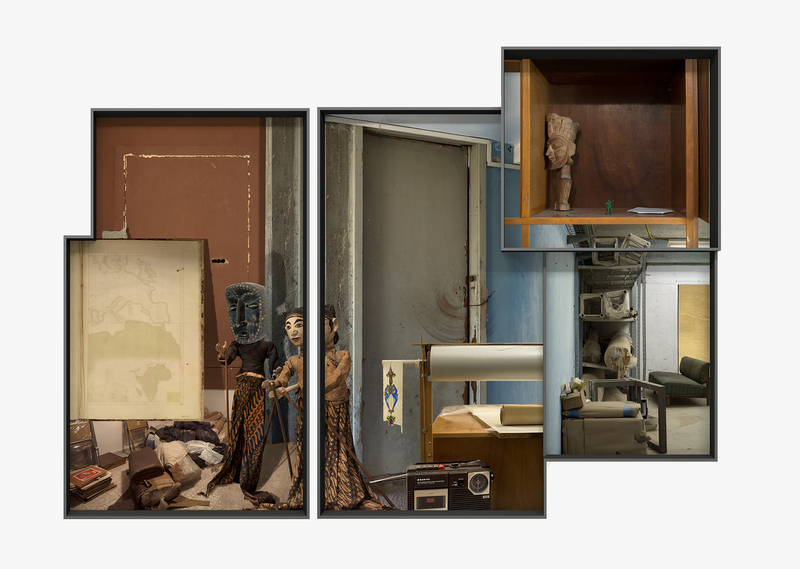 However, on approaching the wall on which the individual photographed objects were arranged like a complex puzzle and listening to the soundtracks, one realized that the panoramic images were a mere option, and the objects were composited together to create just a particular version of reality. In this installation, which brings together the aesthetics of the theater with a sense of behind the scenes, one can never be certain of what one is seeing. 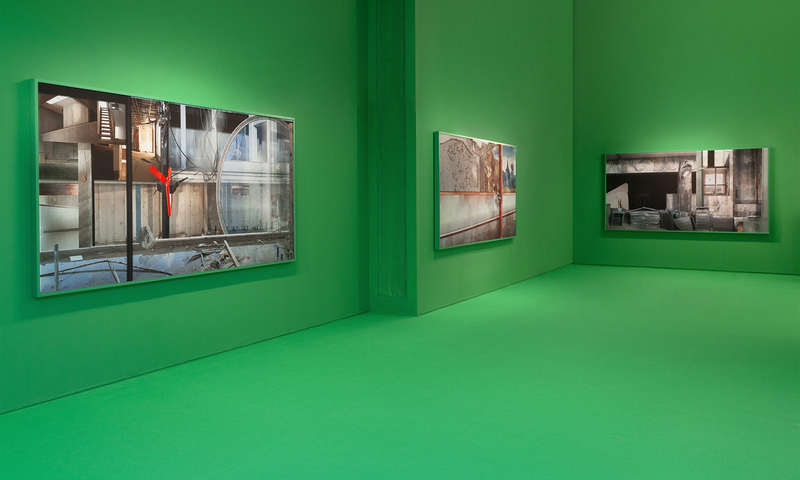 As the panoramas’ titles convey – Third Option, Fifth Option, Sixth Option, and Seventh Option – Shifting Degrees of Certainty presents options of reality, setting side by side the factual and the fictional, the actual and the possible, the visible and the imaginary. 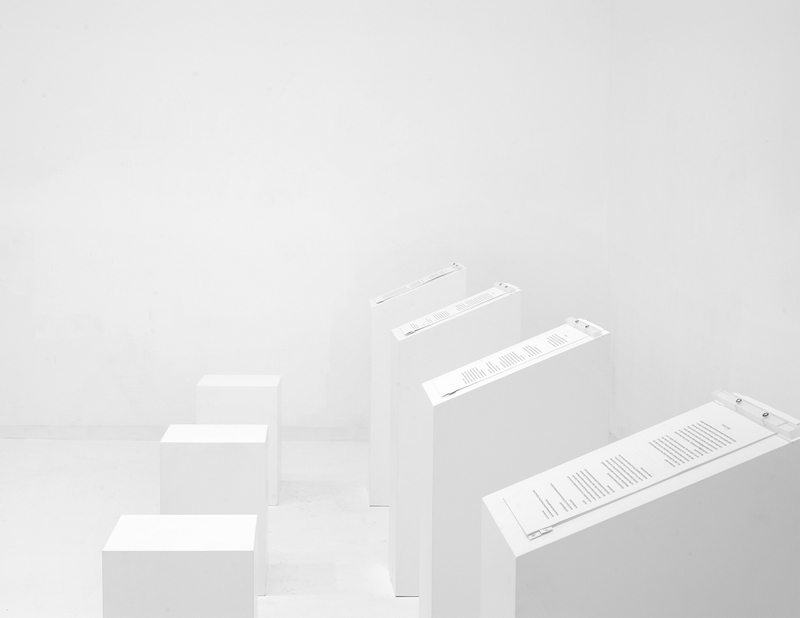 In this nonhierarchical museum installation, where all is possible, the visitors must remains actively engaged in forming their own perspective. 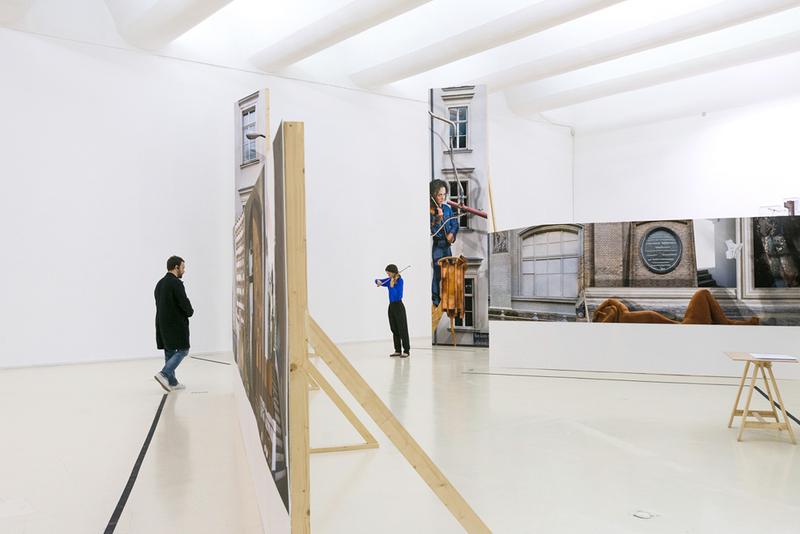 Third Option, 2014, inkjet print, 150X700 cm / 59X276 inch. 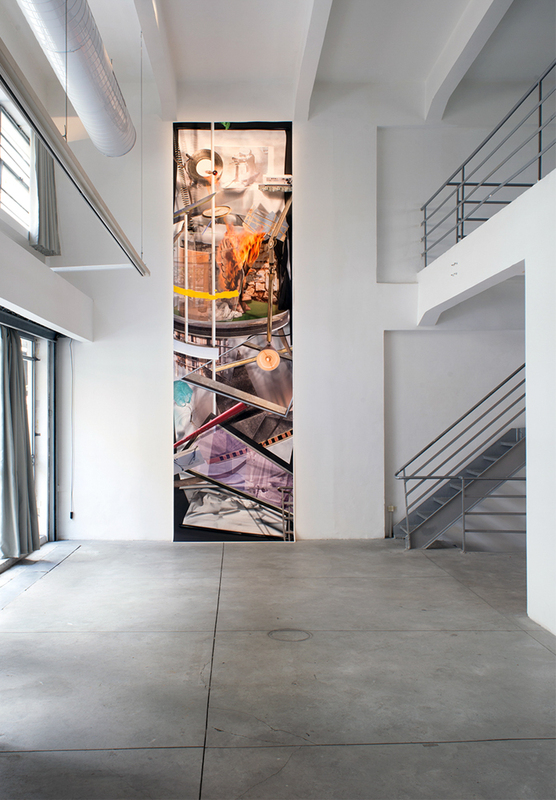 Fifth Option, 2014, inkjet print, 139X486 cm / 55X191 inch. 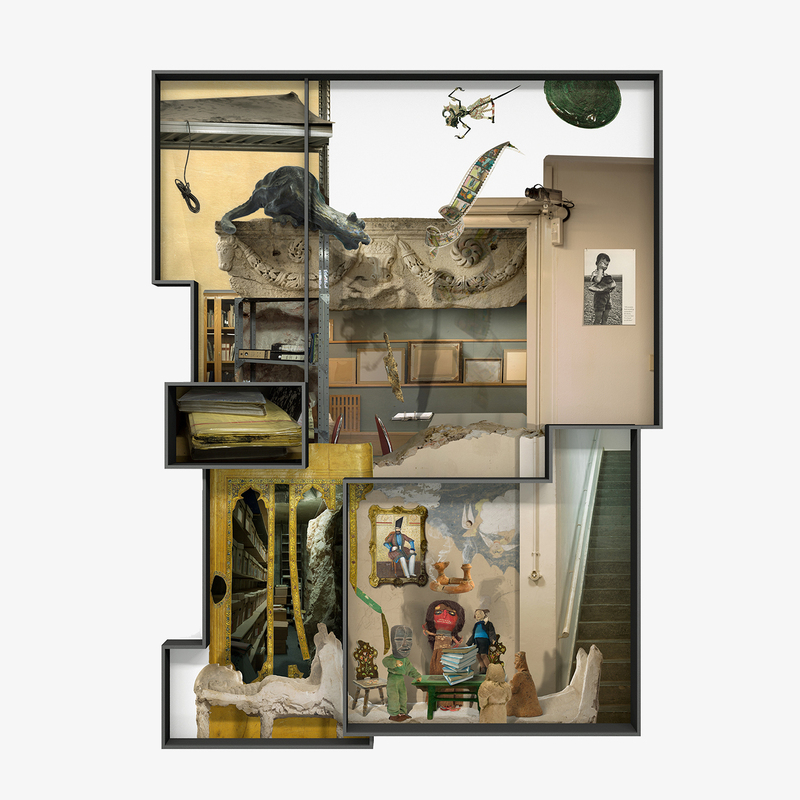 Seventh Option, 2014, inkjet print, 150X1,142 cm / 59X450 inch. 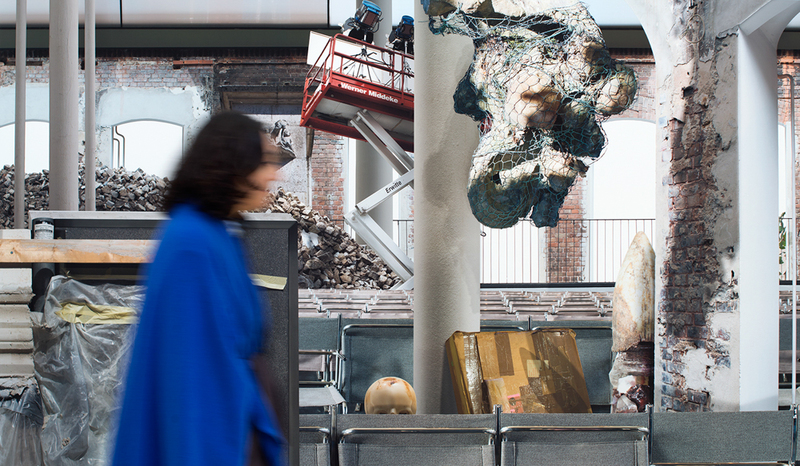 Fourth option, 2014, inkjet print, 88X120 cm / 27X47 inch. 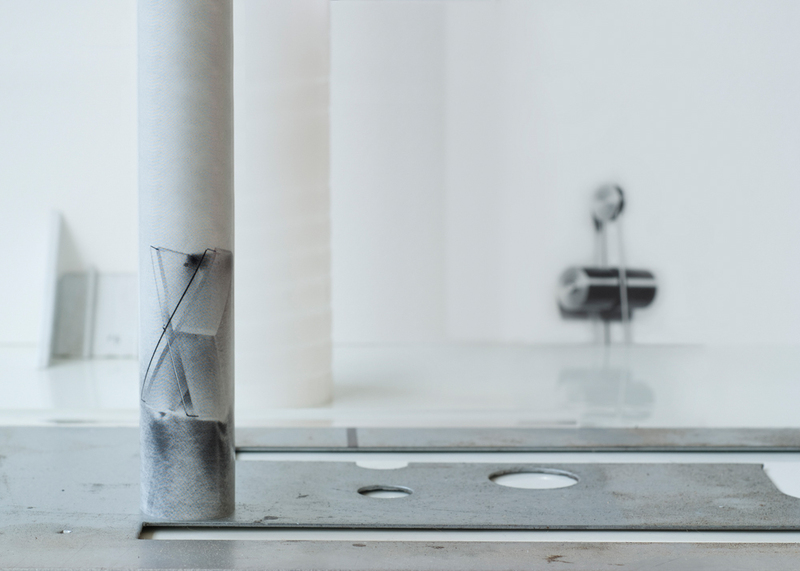 Second Option, 2014, inkjet print, 50X110 cm / 20X43 inch. 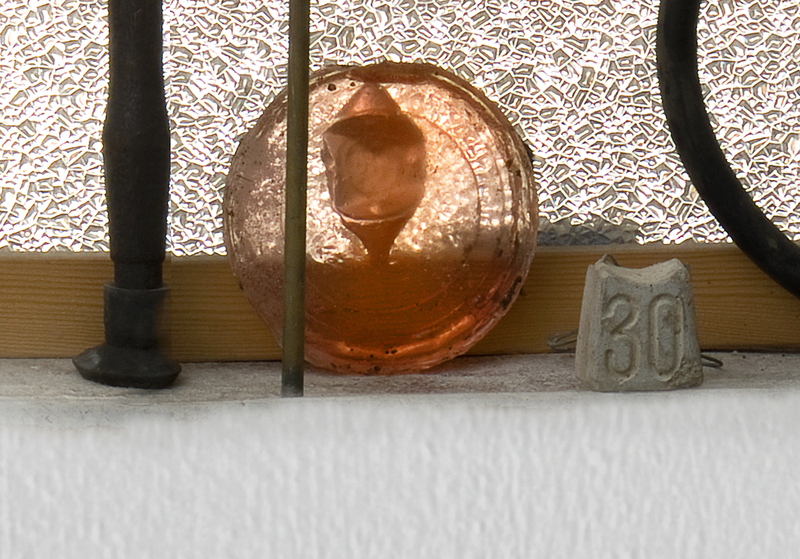 The series of works “Panic in Lack of Event” (2013), which was created over a period of two years, presents objects and architectural elements photographed by Ilit Azoulay in several urban sites, including the building where Braverman Gallery is located in Tel Aviv, which is slated for preservation. 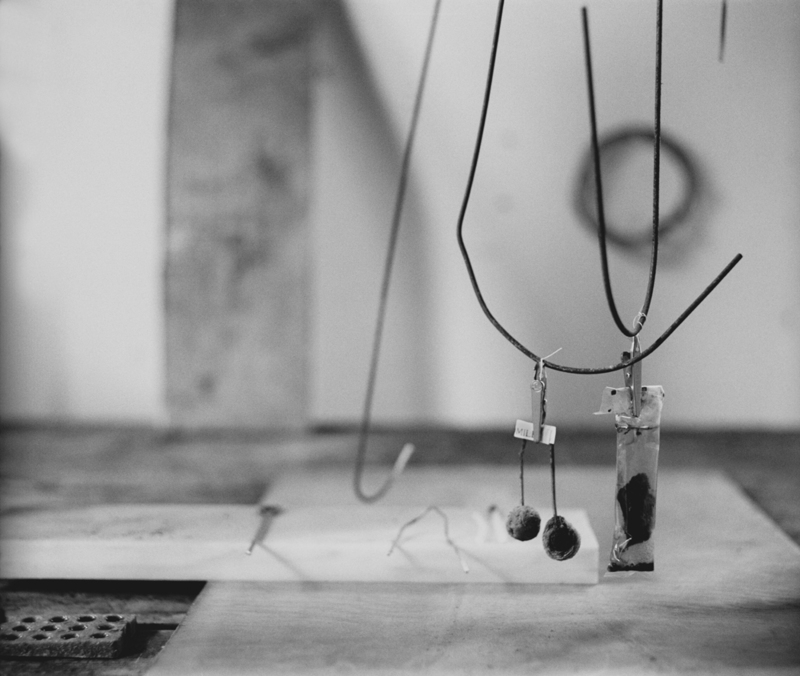 In this series, Azoulay continues her reflexive engagement with the nature of the creative act. 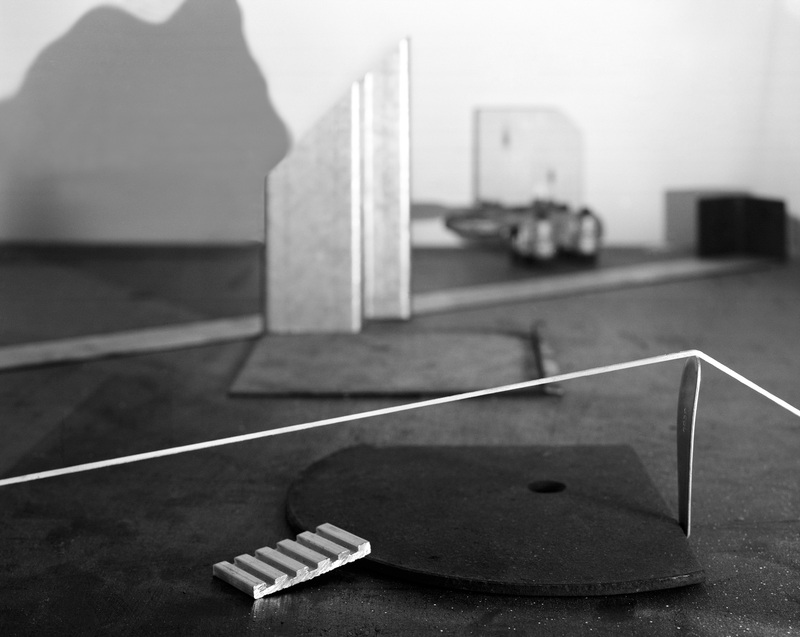 She analyzes its different components while probing its historical and contemporary resonances. Using the formal and conceptual repertoire of the collage medium, the objects depicted in these works are propelled together by a dazzling movement of inner liberation. 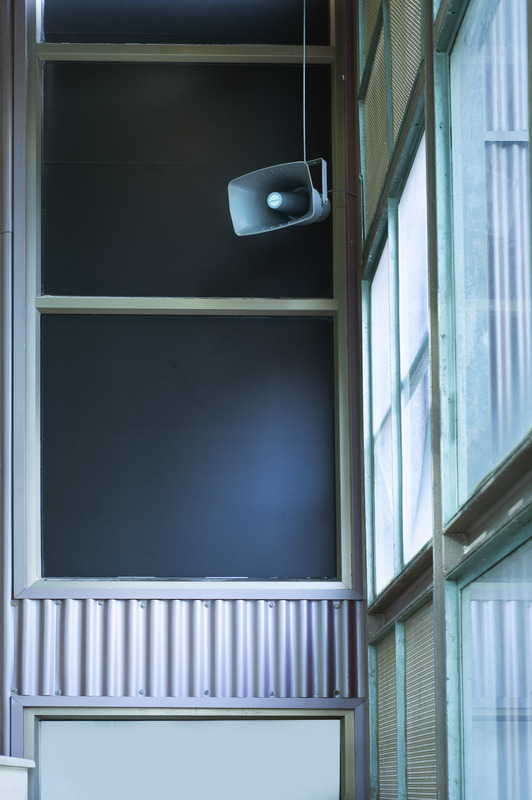 The white-wall texture which served as the background support in most of Azoulay's earlier series is replaced here by a wrinkled, worn-out, silvery-blue curtain previously used as a screen for the projection of slides. 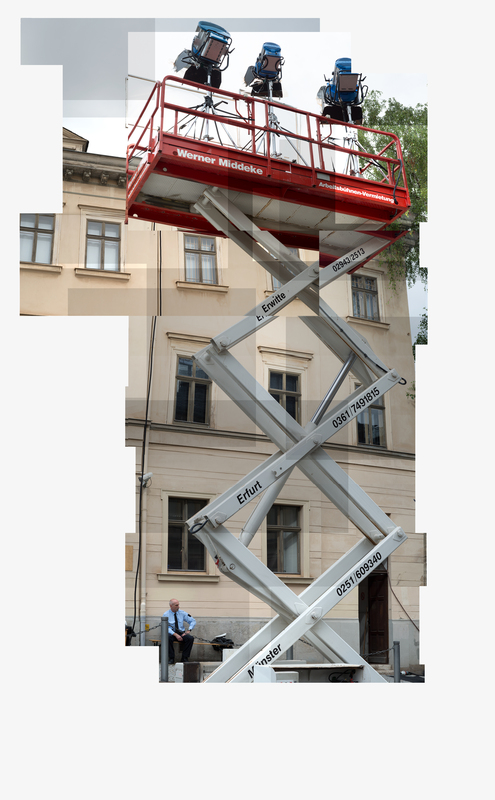 The various ready-made objects photographed appear upon the screen in different opacities. Their mis-en-scène creates dynamic interrelations, as if they are being endlessly projected and re-projected on a hyper-receptive screen. The photographic decisive moment of dramatic action is replaced here by a series of artistic acts. Together, they form a kaleidoscope of anticipated events that are forever being thrust away from any immediate, concrete present. 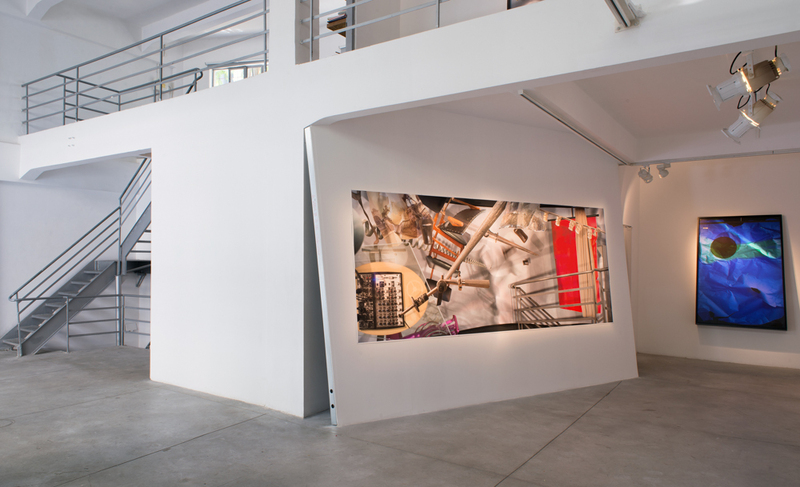 Red, 2013, inkjet print, 150x400 cm / 59x212 inch. 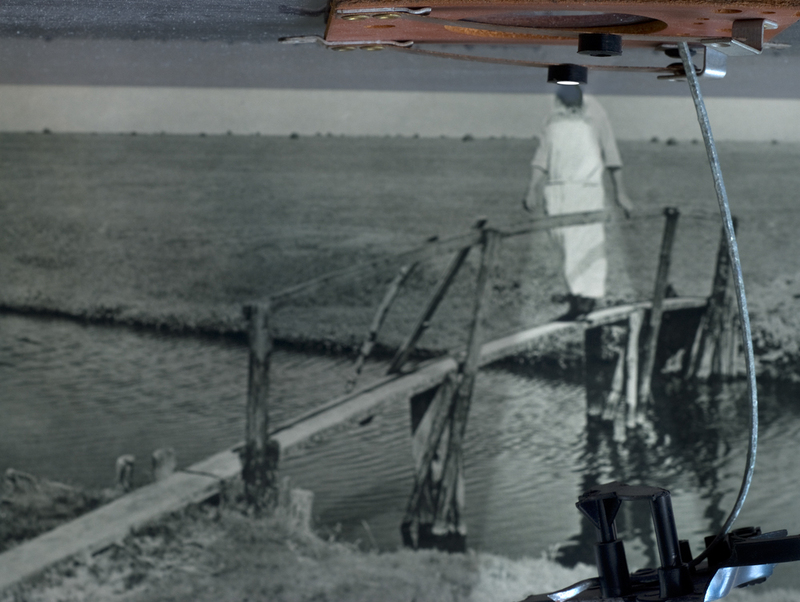 Panic in Lack of Event, 2013, inkjet print, 150X540 cm / 59X212 inch. 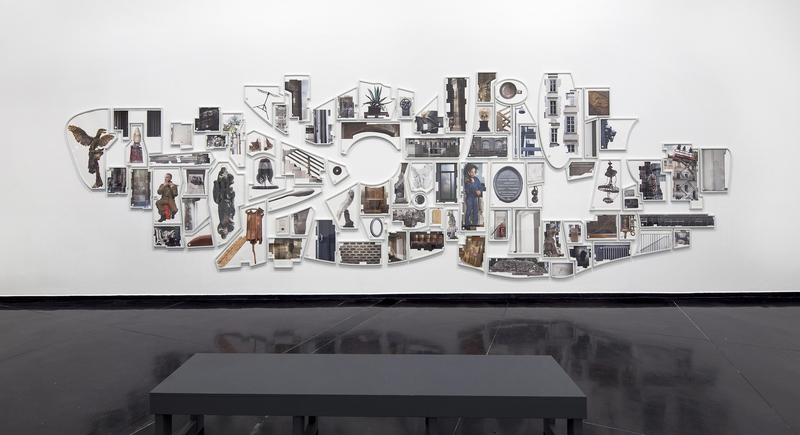 Linguistic Turn, 2013, inkjet print, installation View, Braverman Gallery. 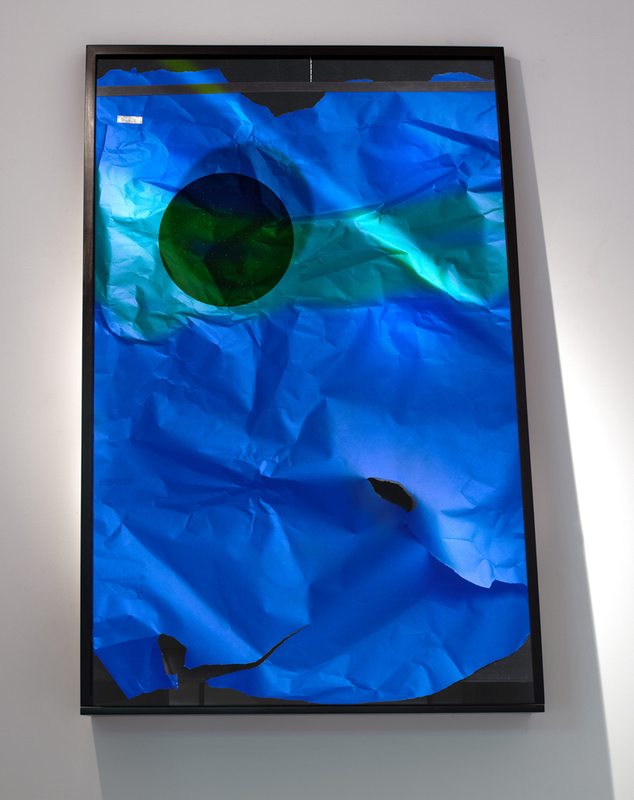 Blue, 2013, inkjet print, 112x166 cm / 44x65 inch. 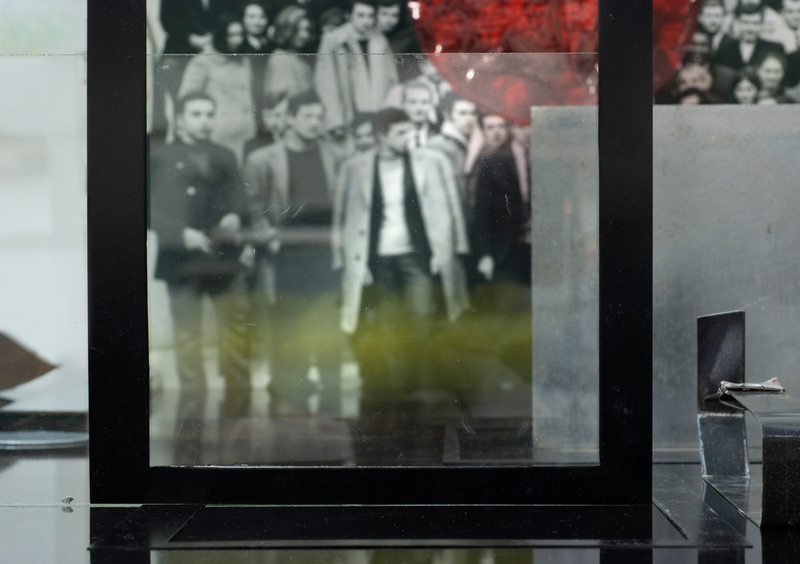 Red Descending a Staircase, 2013, inkjet print, 65x98 cm / 25.5x38.5 inch. 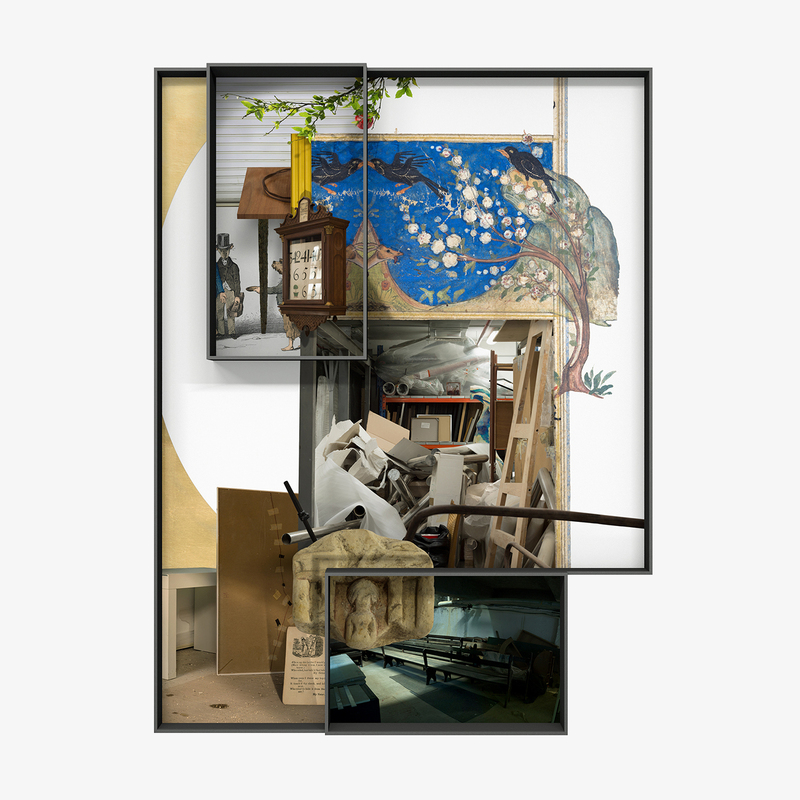 Past Perfect, 2013, inkjet print, 150x184 cm / 59x72.5 inch. 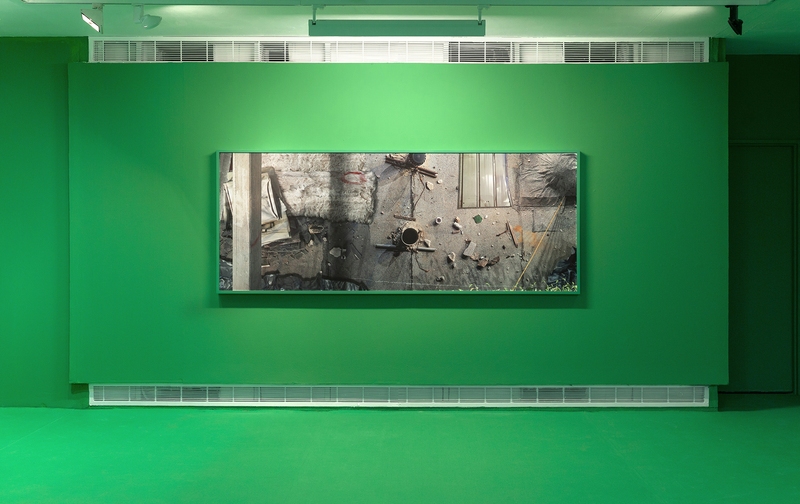 First Option, 2013, inkjet print, 184X150 cm / 59x72.5 inch. 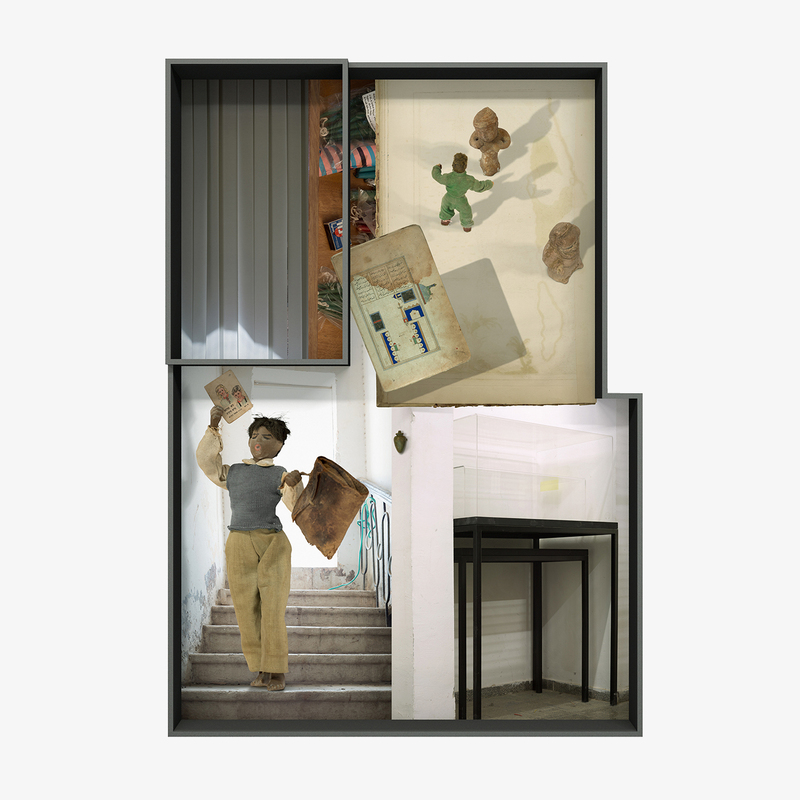 The series “Transition” (2009–2011) has sprung from Ilit Azoulay’s ongoing interest in Israeli architecture. Observing Israeli buildings, one quickly notices a strong sense of immediacy. This architecture of a community in a turbulent state of mind without pause is characterized by an improvised, eclectic style of construction without a clear vision of tomorrow. 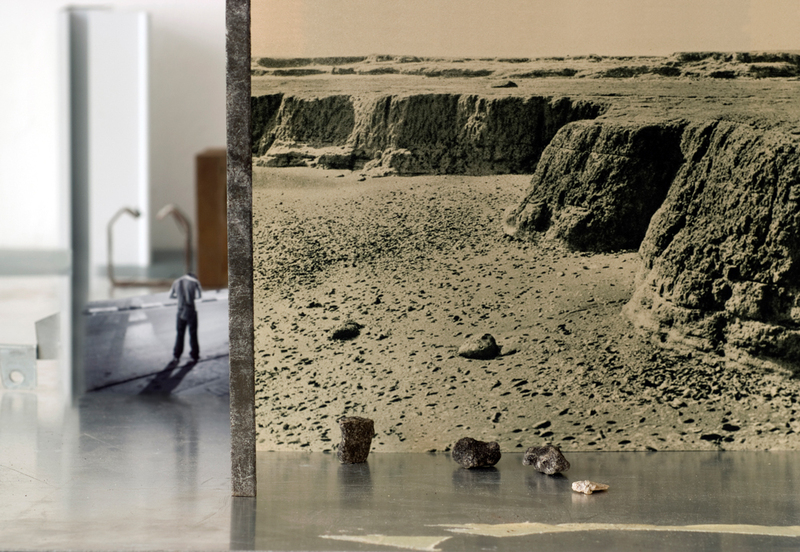 “Passage” is the opening image in this series of dioramas. An empty beach is all that is left of a vanishing community. High cliffs are made small by their juxtaposition with a seemingly headless man – a printed and cut-out image of a photographer looking through a waist-level camera. His gaze will forever remain a secret. 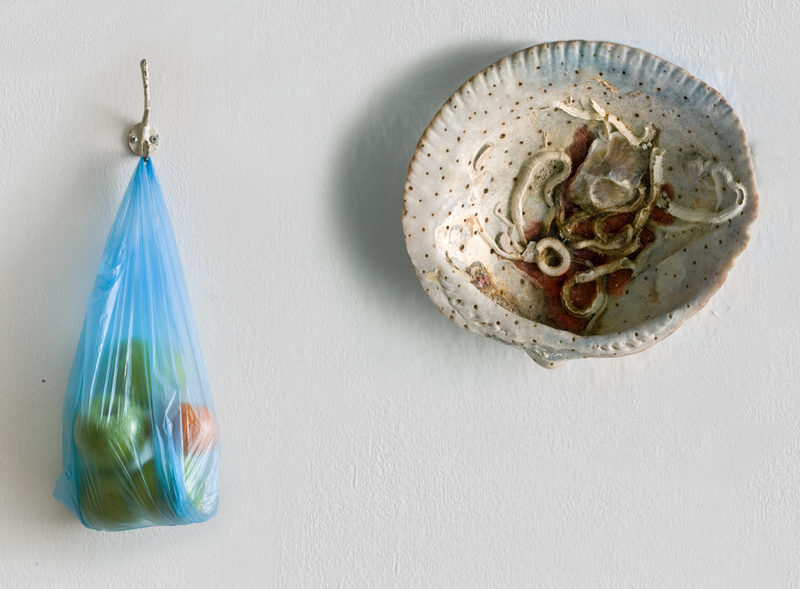 The objects included in this series were collected by the artist on construction sites in the southern neighborhoods of Tel Aviv. 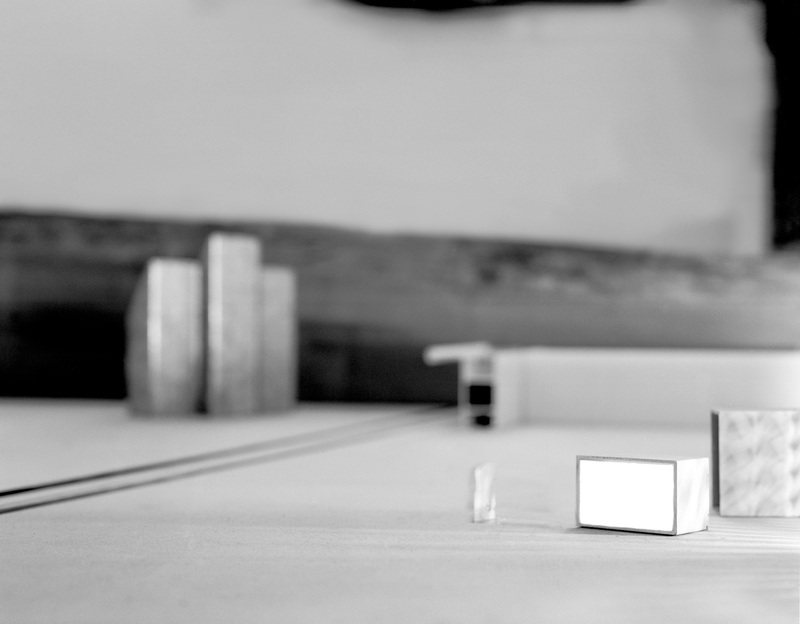 She then placed them on a table and photographed them from a single point of view. 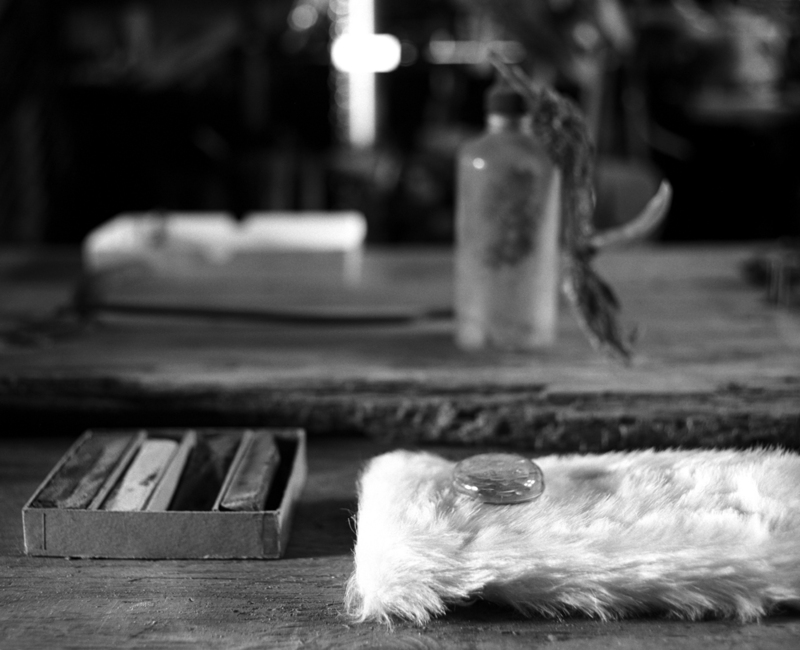 She used mirrors to lure the light in and create a suggestion of a place. A carefully thought out arbitrariness is assembled, where all the objects are redefined by the emptiness in which they find themselves. 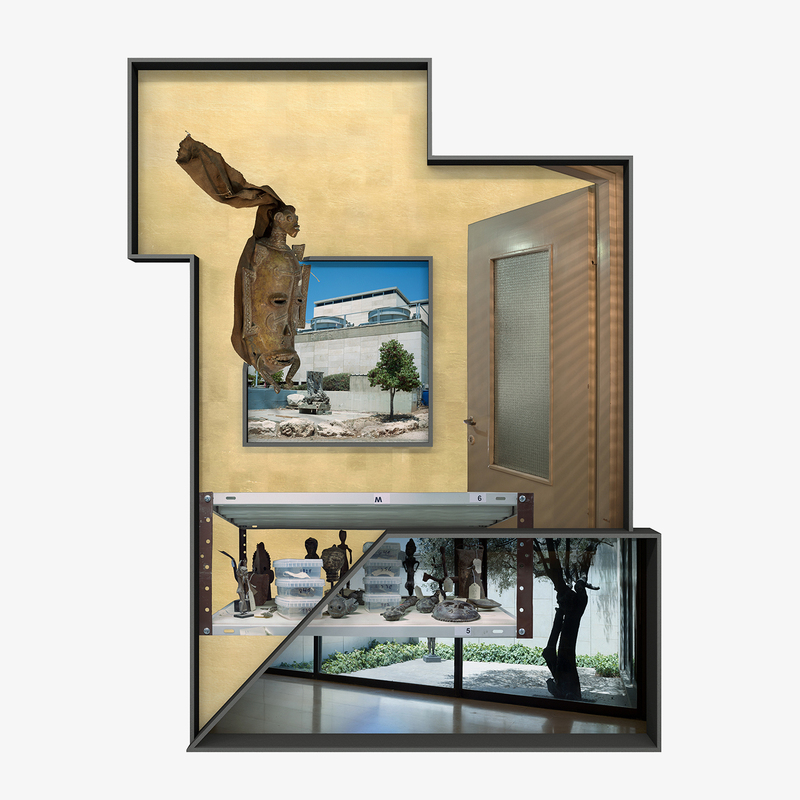 Although each installation portrayed presents a singular still moment, they are all named after transitional spaces, both modern and mythical in meaning: Passage, The Gate, Lobby, Tunnel, Bridge, and Transition. As such, they express an ambiguous relation to permanence. These are still images that do not allow one pause but rather subject the human figures frozen within them to a nomadic destiny. Passage, 2009, inkjet print, 33x47 cm / 13x18 inch. 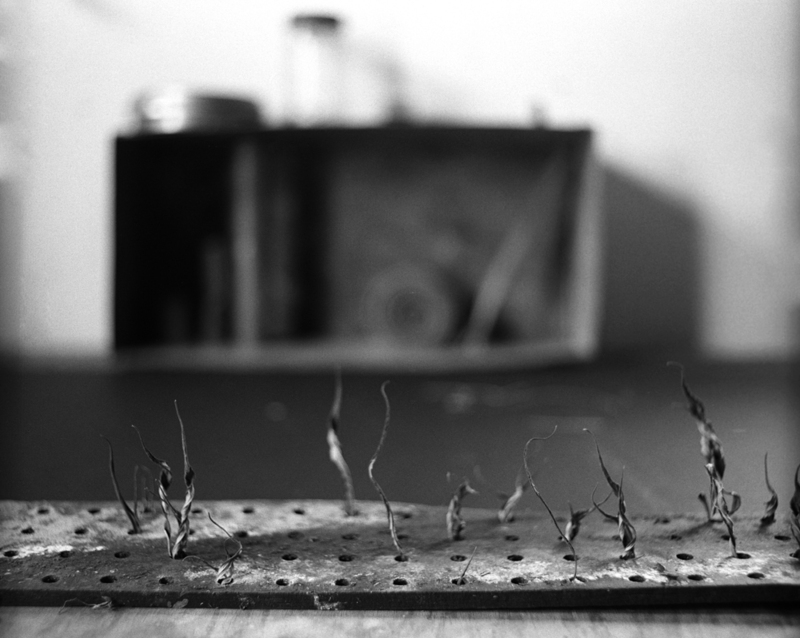 The gate, 2010, inkjet print, 33x47 cm / 13x19 inch. Tunnel, 2010, inkjet print, 33x45 cm / 13x17.5 inch. 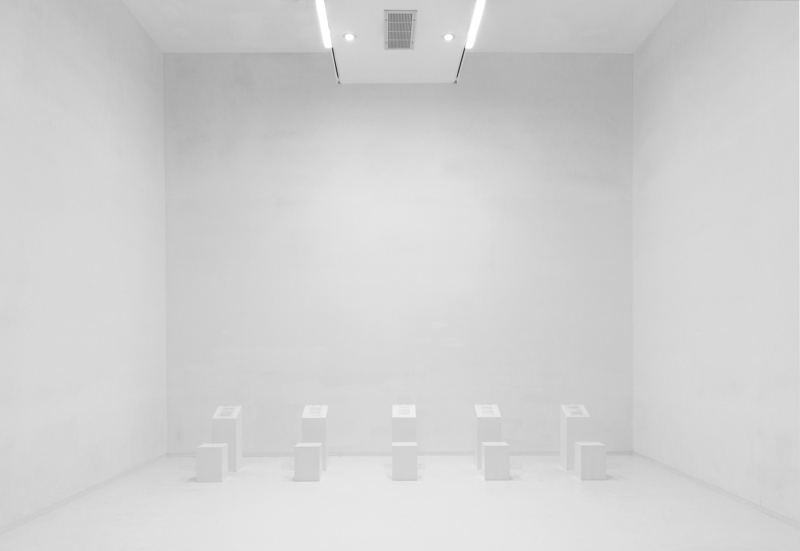 Lobby, 2010, inkjet print, 33x45 cm / 13x17.5 inch. 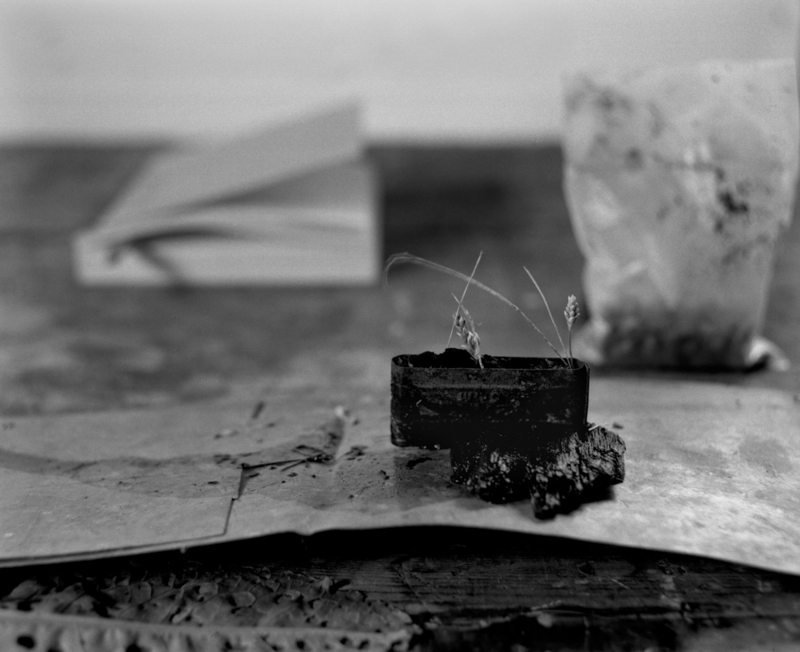 Transition, 2010, inkjet print, 33x47 cm / 13x18 inch. 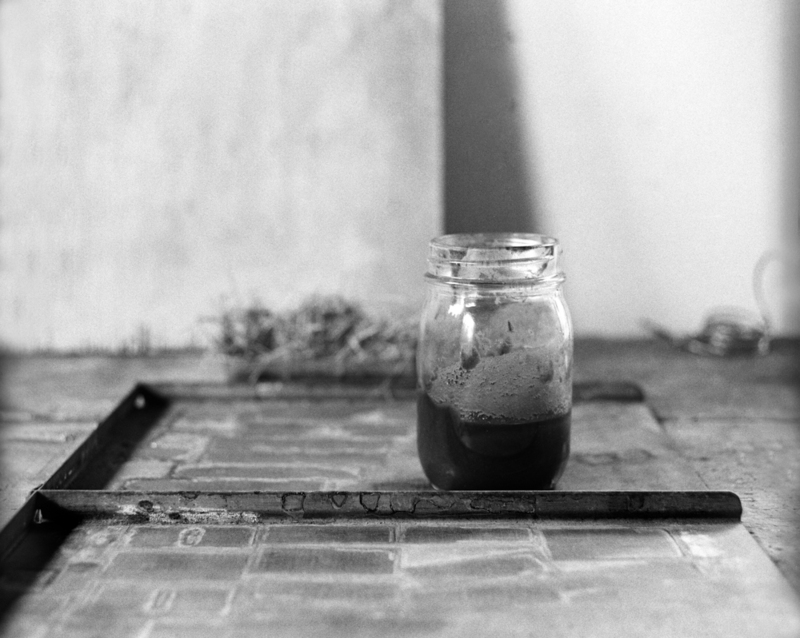 Bridge, 2011, inkjet print, 33x47 cm / 13x18 inch. History deposits its sediments on walls like paint on canvas. 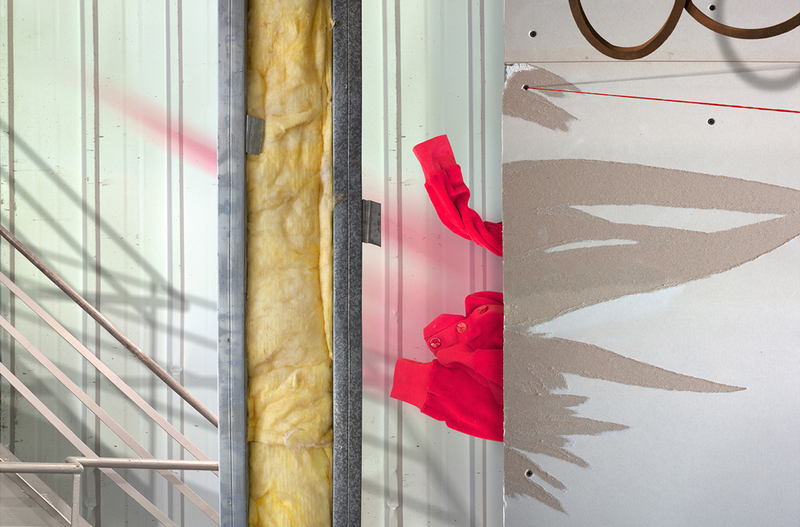 Once constructed, walls begin to absorb light, sound, humidity, and layered traces that form over time. 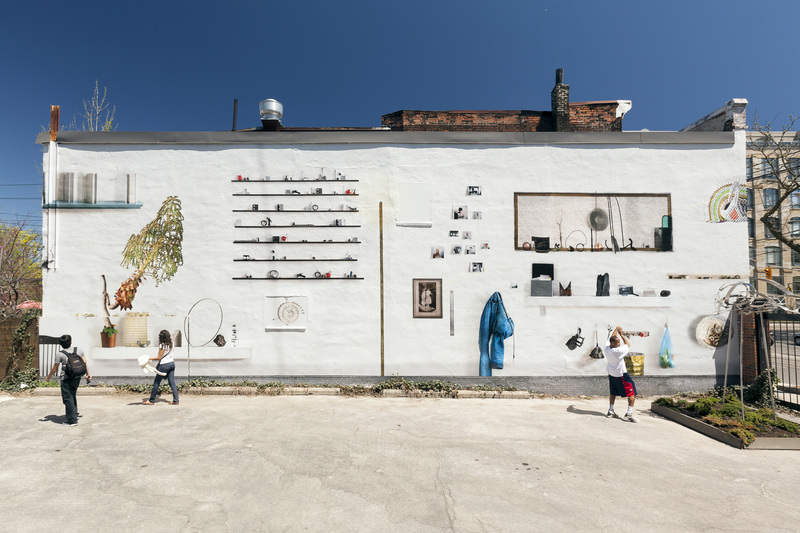 Functioning as a support and a façade, walls define a place by marking its boundaries, at the same time registering all that has accumulated in the spaces they circumscribe. 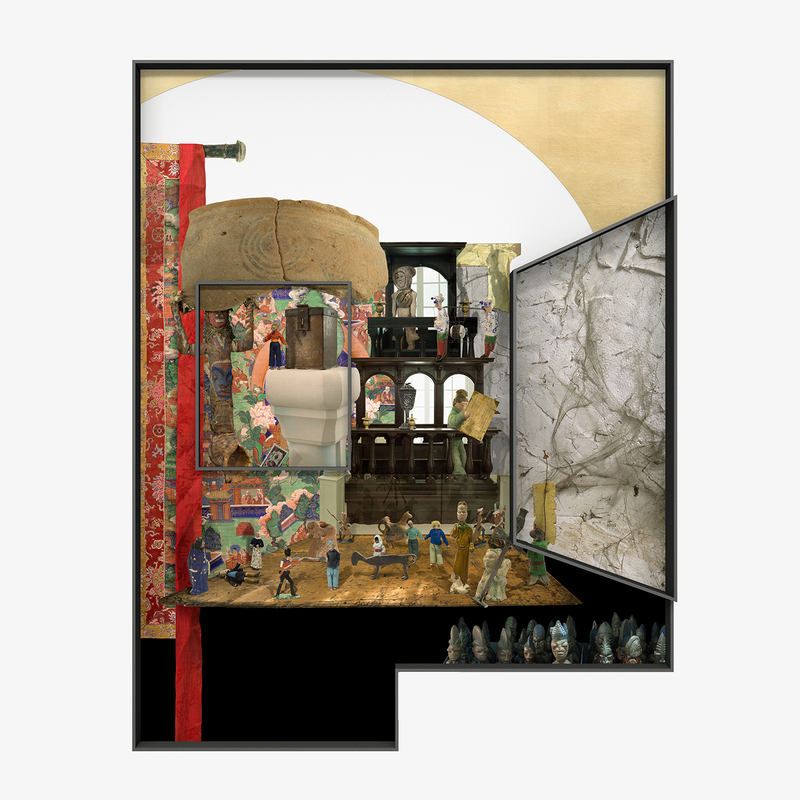 Composed as a large panorama (measuring 10.5 meters in length), Room #8 features eight entrances and exits. 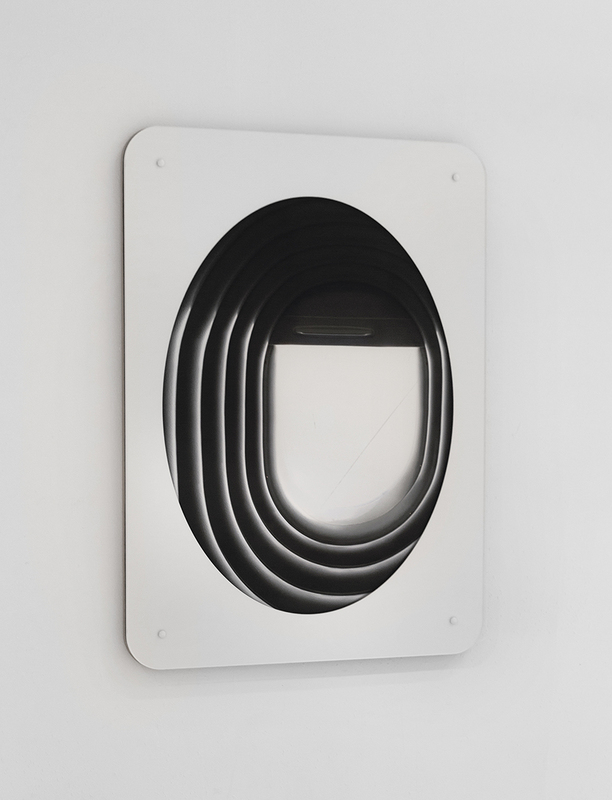 Some are clearly architectural fixtures, such as a window or a sliding door, while others are abstracted metaphors to be deciphered by the viewer. 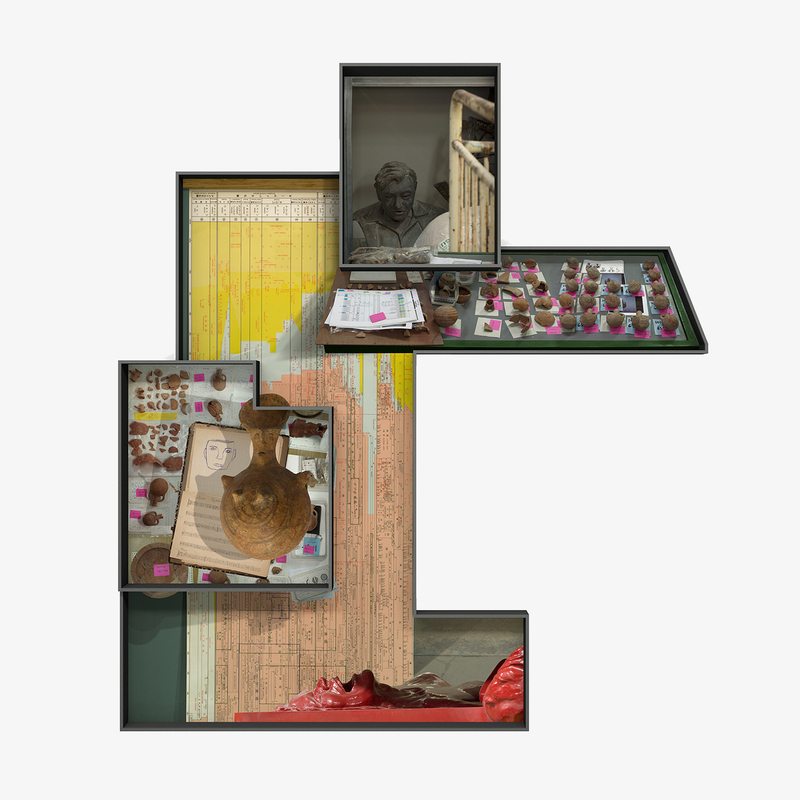 This flat mis-en-scène could hypothetically be "folded" to create a room with four walls – a space whose indeterminate function is imbued with a sense of mystery. 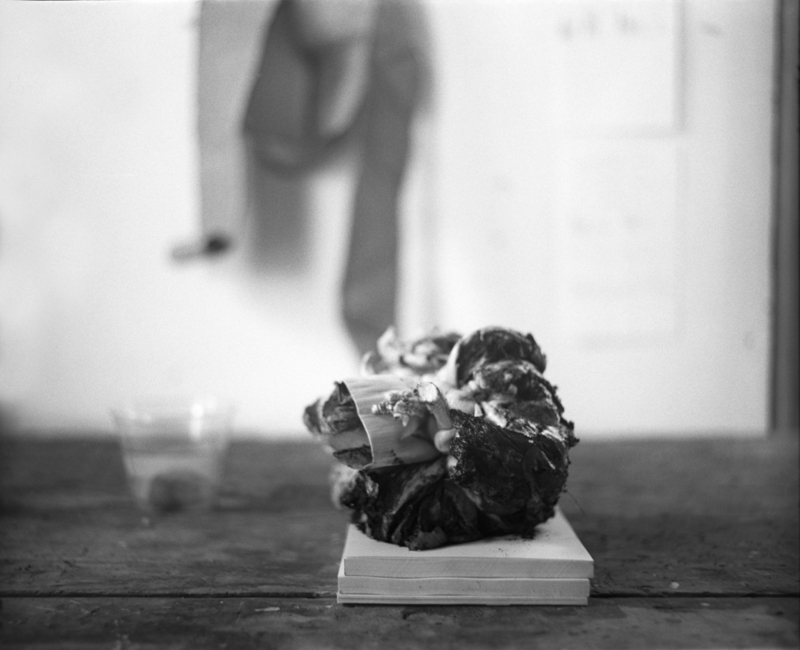 The absence of a single, linear narrative and the presence of multiple possibilities immerse the viewer in a non-hierarchical perceptual experience, in which seemingly familiar artifacts prove to be unidentifiable. An occasional reference to a well-known work of art, such as Duane Hanson's sculpture Tourists, is given no more prominence than a sliced apple or a row of sticks. 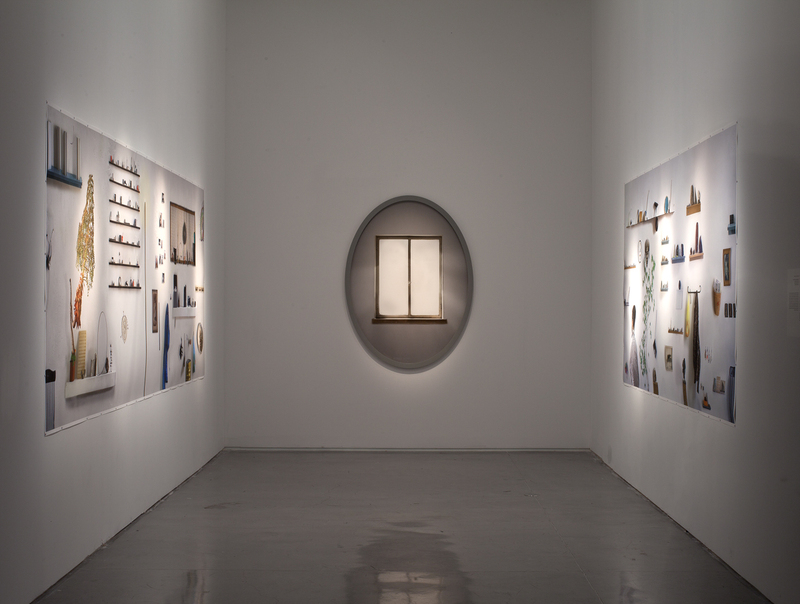 Appearing at once realistic and imaginary, Room #8 probes the conventional limitations that govern human perception. 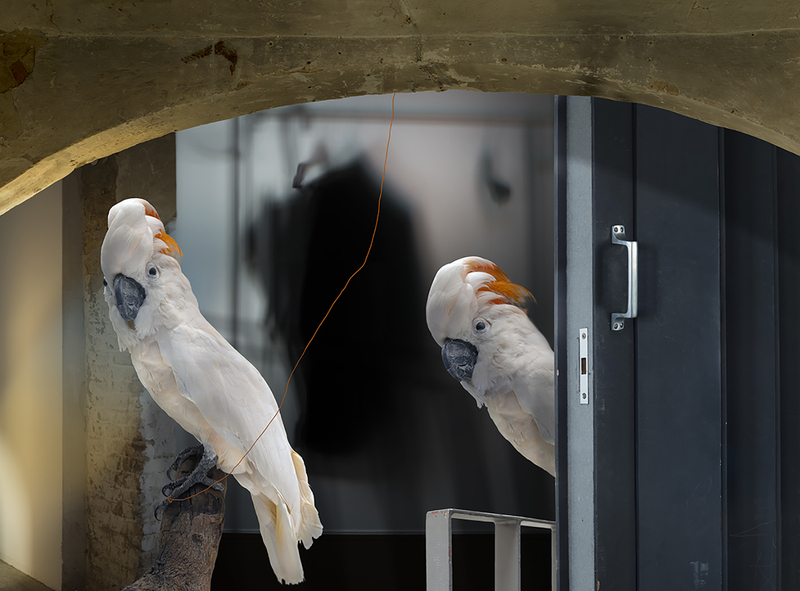 The work's title – a play on the word “roommates” – openly invites the viewers to inhabit it. 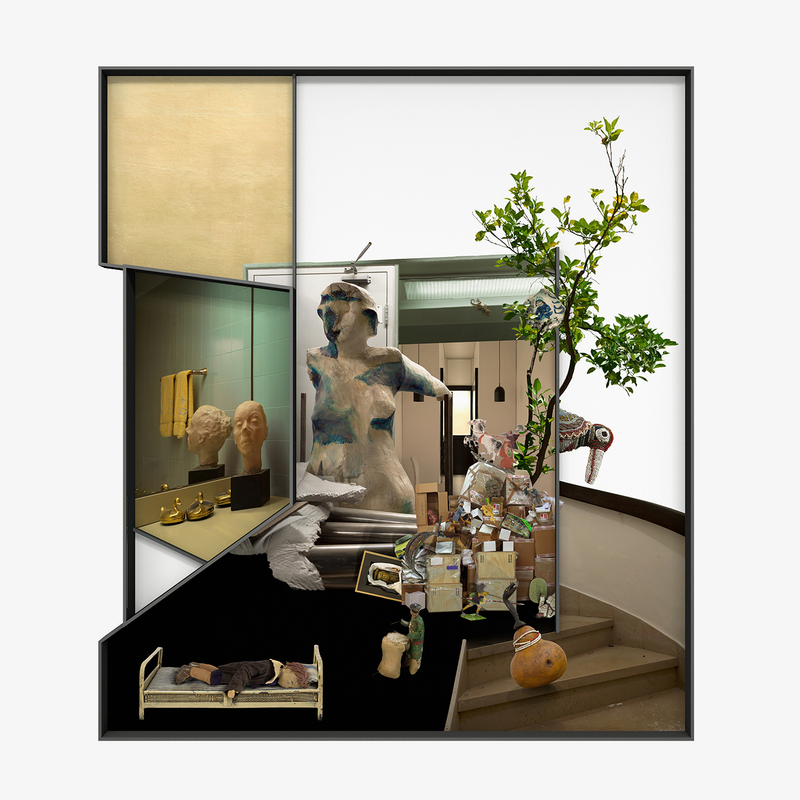 Room #8, 2011, inkjet print, 150x1000 cm / 59x373 inches. 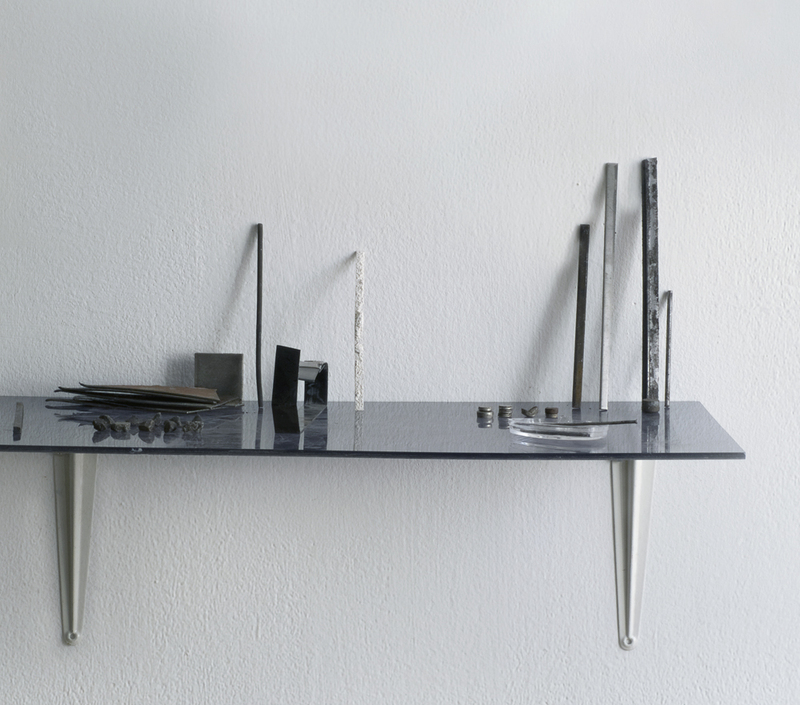 Raising questions about the wondrous mechanism of sight and perception, “The Keys” series (2010) was inspired by the artist’s wandering through the city of Tel Aviv. 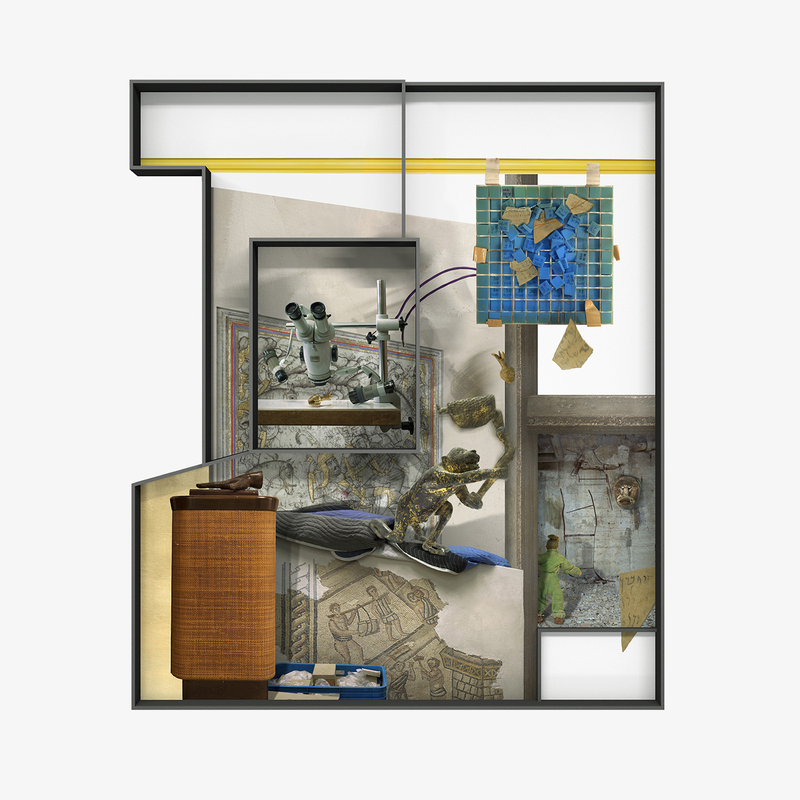 Visiting empty buildings marked for demolition and others designated for conservation, Ilit Azoualy studied the textures of different walls and the objects she discovered embedded within them. When she began researching these buildings in depth, she discovered that in the 1950s and 1960s, during the so-called austerity period that followed the founding of the State of Israel, contractors used improvised building materials in order to meet the massive demand for construction at a time when great waves of immigration were arriving in the country. In almost every building slated for demolition, Azoulay found at least one wall made of various discarded materials and objects rather than cement blocks. 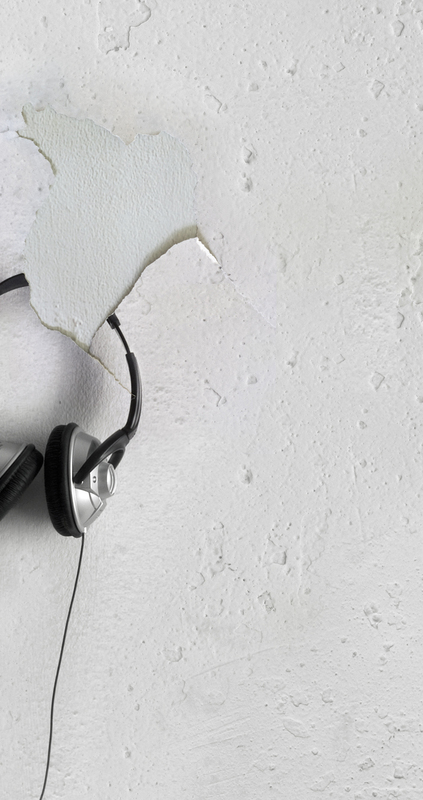 Such “fake walls,” as she calls them, suffered more than others from the effects of humidity, had a larger number of cracks, and were easier to demolish. 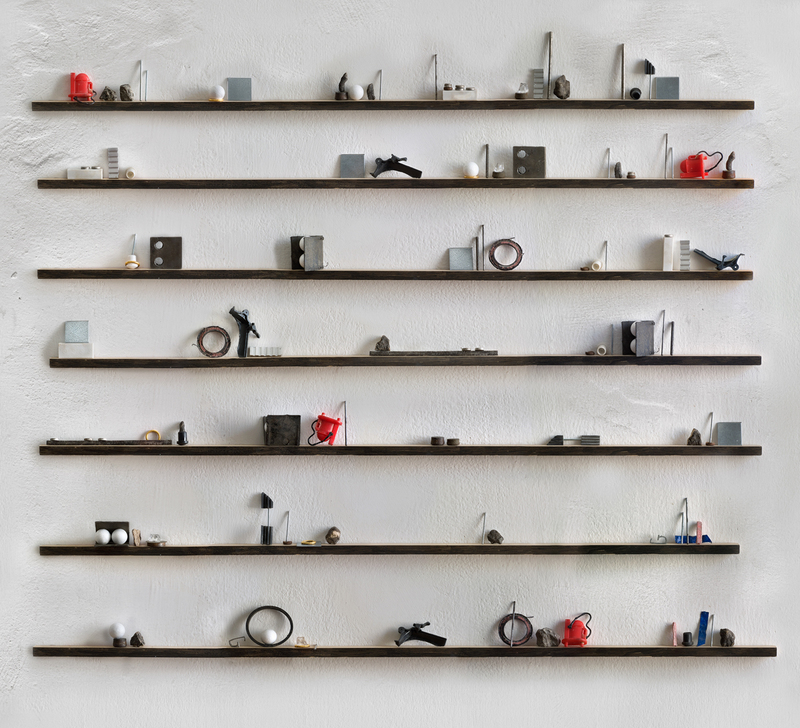 Returning repeatedly to the same sites, Azoulay collected the objects she found inside these walls, such as metal, plastic, and aluminum scraps, stones, glass shards, seashells, apple seeds, and broken toys. 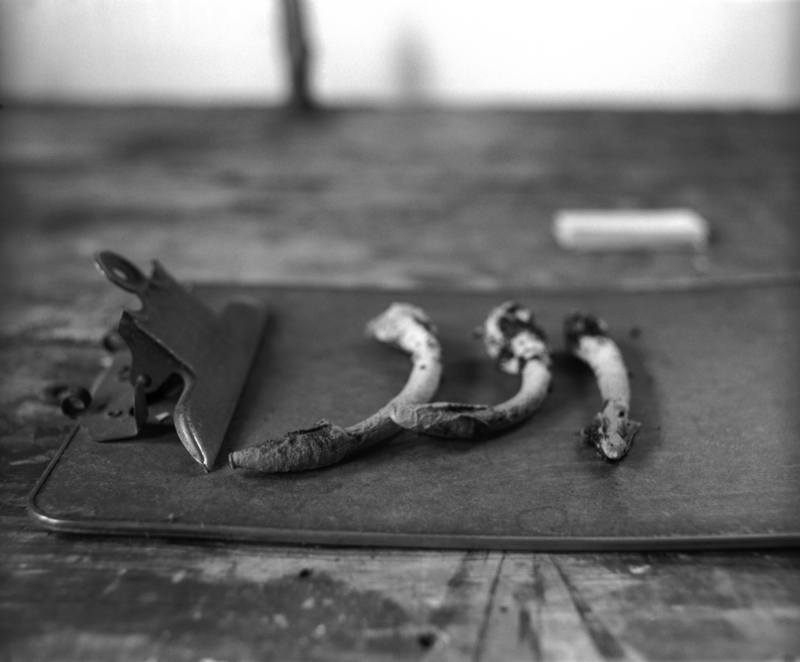 These scattered fragments, which no longer served a functional purpose, she took to her studio. There, she cleaned them as specimens and then photographed them, using a macro lens, all in the same natural light. 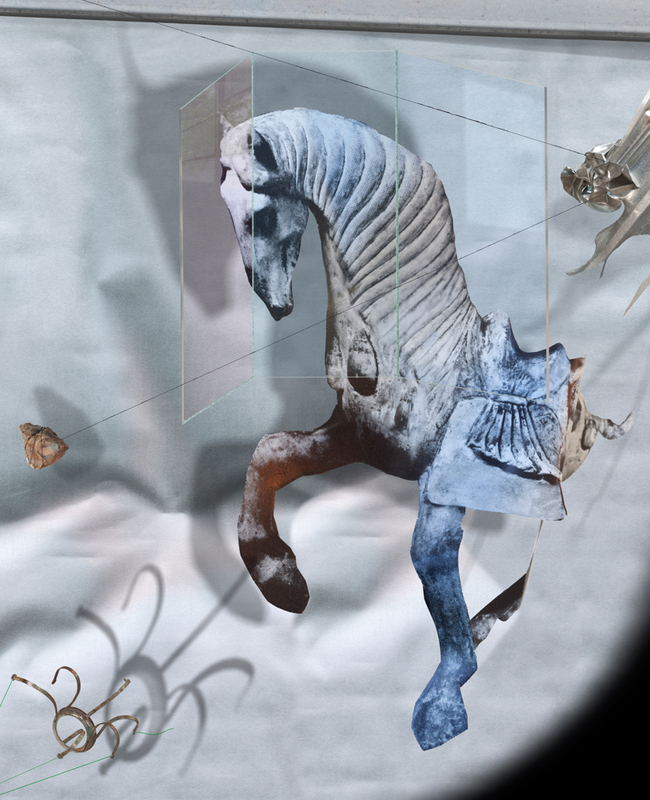 These images were then composited together digitally. 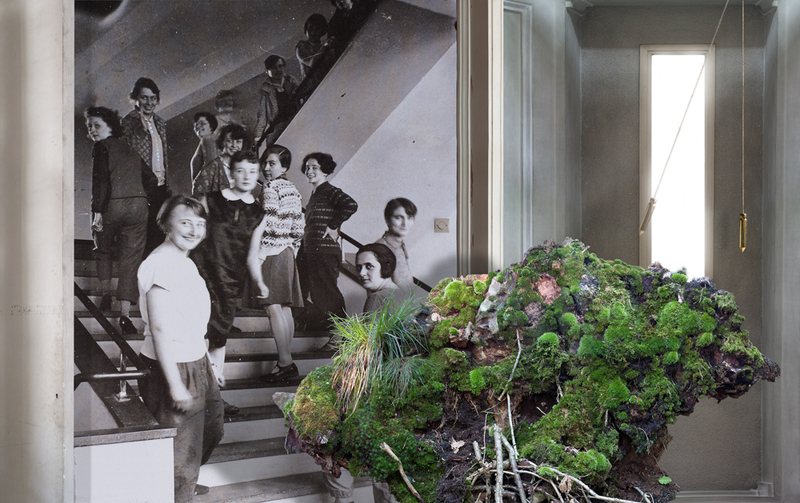 Tree For Too One, 2010, inkjet print, 150x500 cm / 58.5x195 inch. 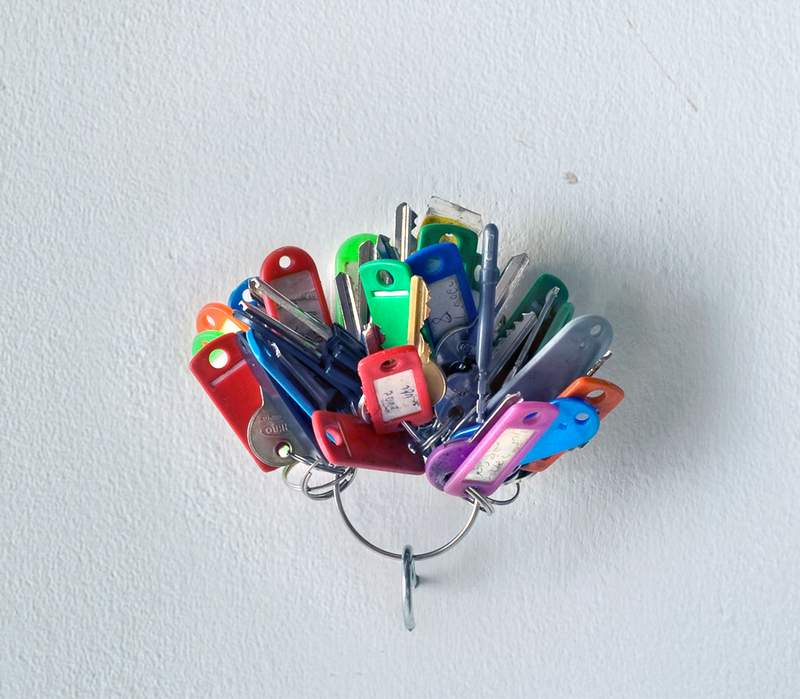 The Keys, 2010, location View, Israel Museum of Art, Jerusalem. 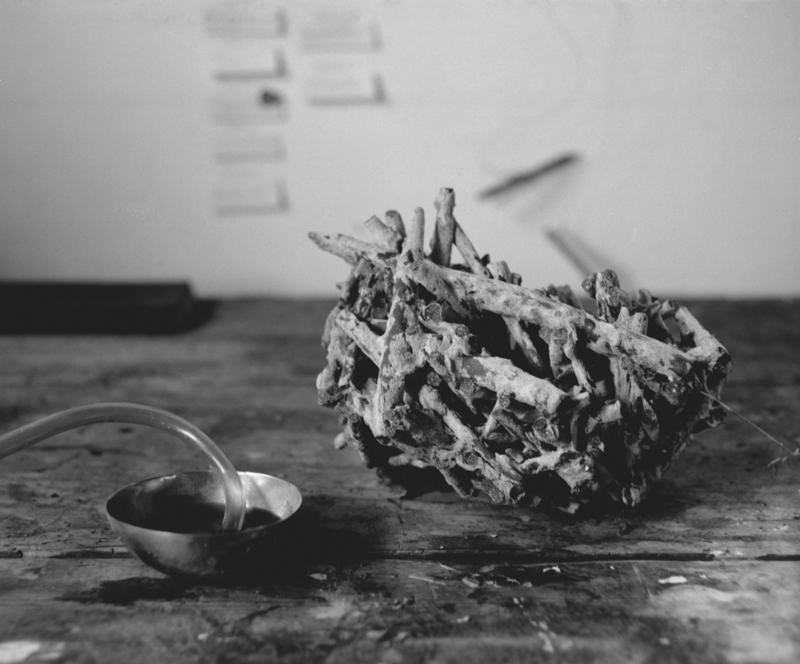 Tree For Too One Too, 2010, inkjet print, 89X99 cm/35 x 39 inches. 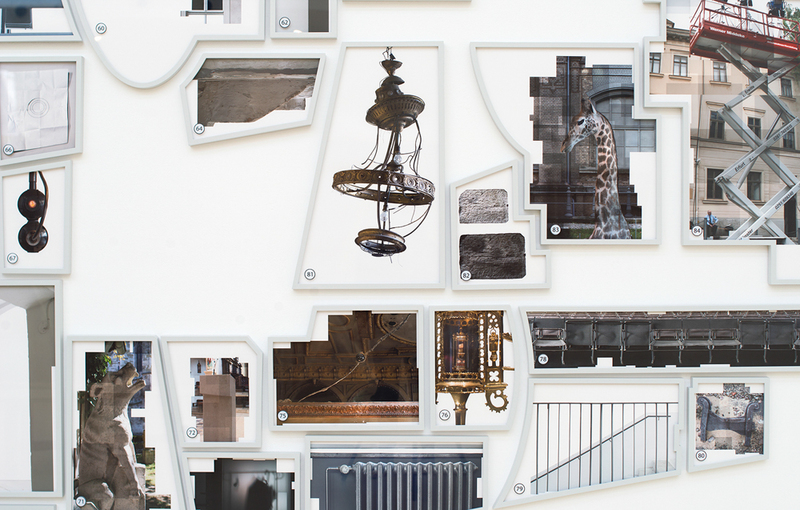 The Keys, 2010, inkjet print, 150x370 cm / 58.5x144 inch. 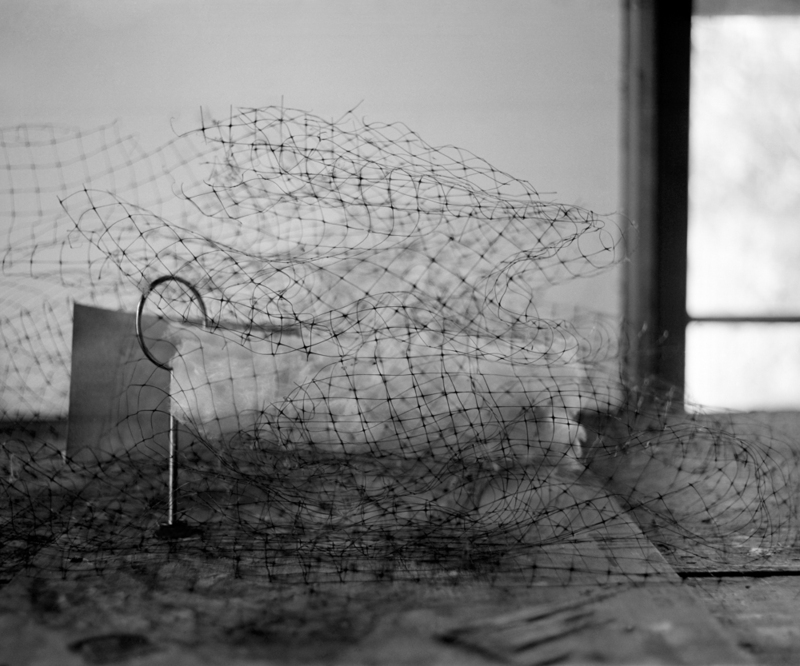 The series “Unknown Aspects” (2008) was developed during a residency program at Art Farm in Nebraska, USA. 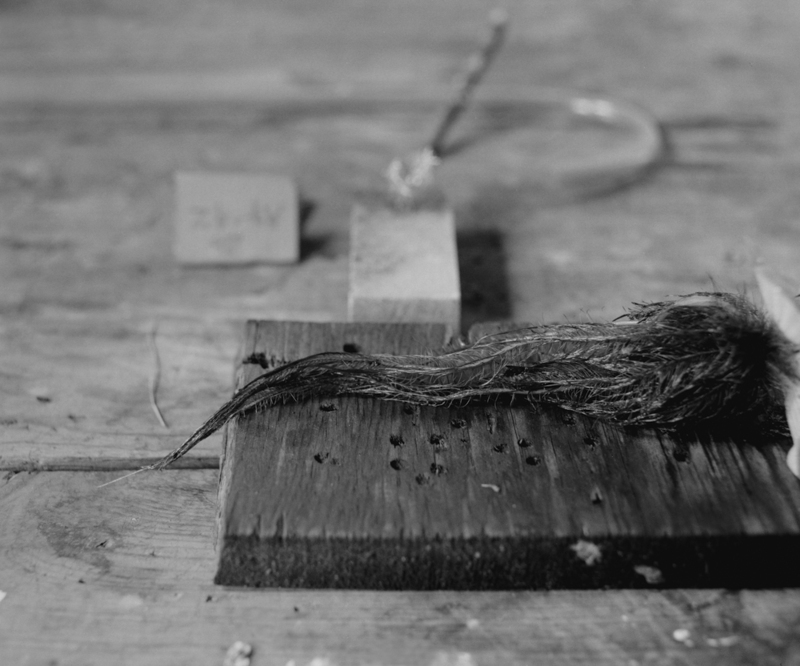 In this extraordinary art space, Ilit Azoulay found numerous eccentric collections (old letters, wooden wheelchairs, and rusty screws, to name but a few) stored in states ranging from total disarray to perfect classificatory order. 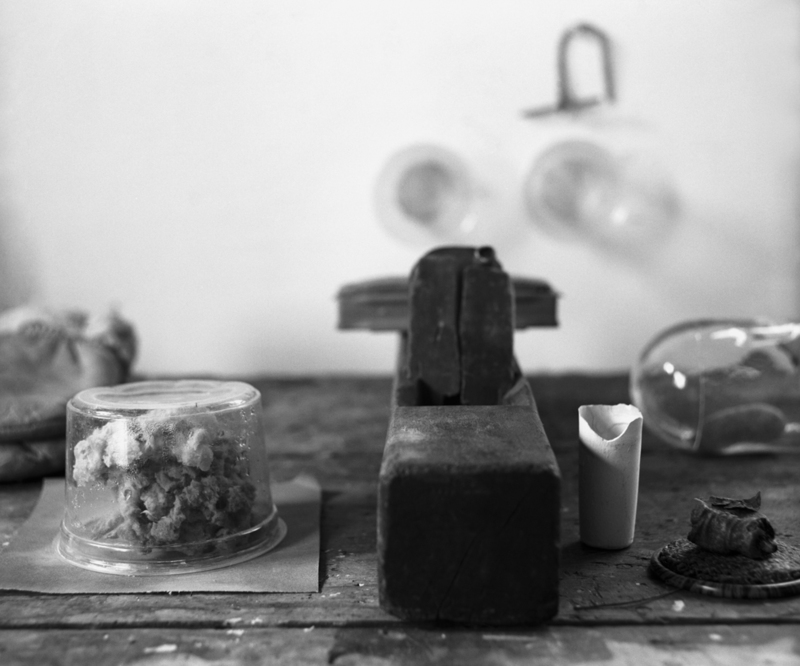 Azoulay created small installations with objects found in these collections and then photographed them. 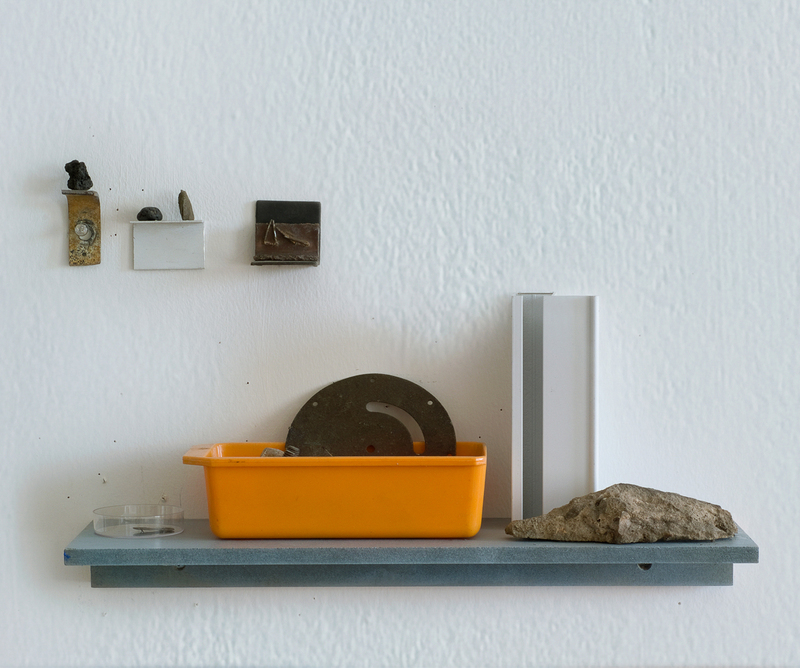 This strategy probed a philosophical and visual paradox concerning the state of the collected objects – their inherent “thingness” in their original context, as well as their ability to exist outside of it while remaining whole. 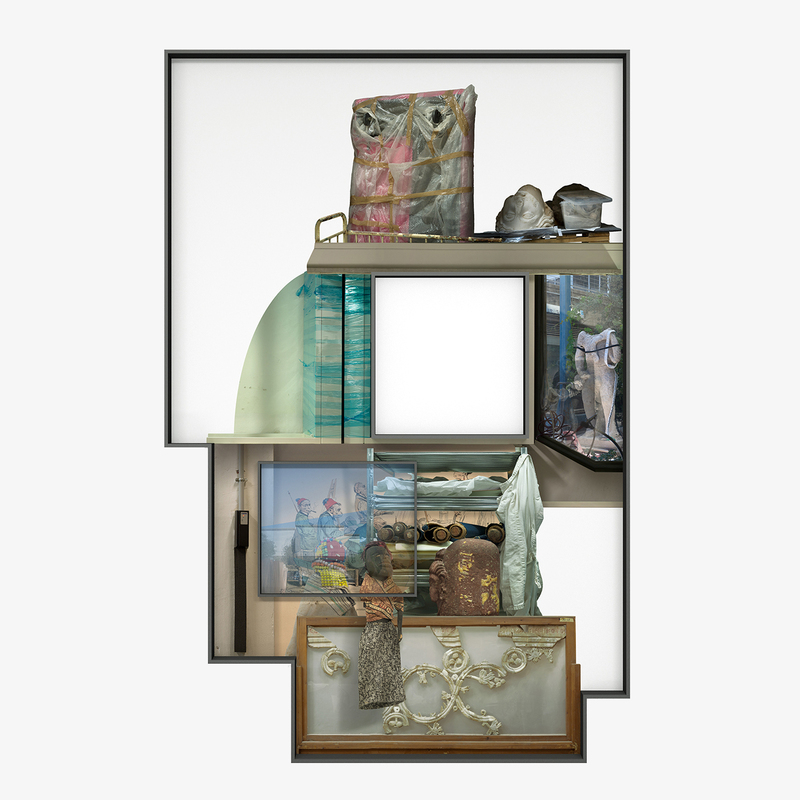 By collecting bits and pieces from the “pile of debris”** before her and repositioning them in a new photographic context, Azoulay both heightens and questions the uniqueness of every object. 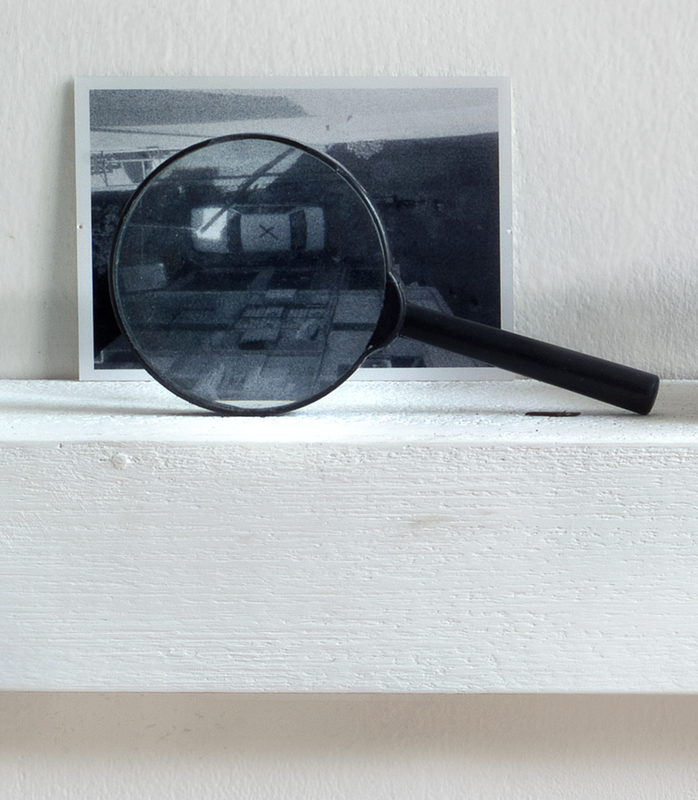 Displayed for the viewer's investigative gaze, the objects within each photograph incessantly speak of their past while being assimilated into a new environment. * Hannah Arendt, “Introduction: Walter Benjamin: 1892-1940,” in Walter Benjamin, Illuminations, ed. Hannah Arendt, trans. Harry Zohn (New York: Schocken Books, 1969) p. 45. ** Walter Benjamin, “Theses on History,” Illuminations, p. 257. Unknown Aspect no. 1, 2008, inkjet print, 33x40 cm / 13x16 inch. Unknown Aspect no. 2, 2008, inkjet print, 33x40 cm / 13x16 inch. Unknown Aspect no. 3, 2008, inkjet print, 33x40 cm / 13x16 inch. Unknown Aspect no. 4, 2008, inkjet print, 33x40 cm / 13x16 inch. Unknown Aspect no. 5, 2008, inkjet print, 33x40 cm / 13x16 inch. Unknown Aspect no. 6, 2008, inkjet print, 33x40 cm / 13x16 inch. Unknown Aspect no. 7, 2008, inkjet print, 33x40 cm / 13x16 inch. Unknown Aspect no. 8, 2008, inkjet print, 33x40 cm / 13x16 inch. Unknown Aspect no. 9, 2008, inkjet print, 33x40 cm / 13x16 inch. Unknown Aspect no. 10, 2008, inkjet print, 33x40 cm / 13x16 inch. Unknown Aspect no. 11, 2008, inkjet print, 33x40 cm / 13x16 inch. Unknown Aspect no. 12, 2008, inkjet print, 33x40 cm / 13x16 inch. Unknown Aspect no. 13, 2008, inkjet print, 33x40 cm / 13x16 inch. Unknown Aspect no. 14, 2008, inkjet print, 33x40 cm / 13x16 inch. Unknown Aspect no. 15, 2008, inkjet print, 33x40 cm / 13x16 inch. Unknown Aspect no. 16, 2008, inkjet print, 33x40 cm / 13x16 inch. Unknown Aspect no. 17, 2008, inkjet print, 33x40 cm / 13x16 inch. Unknown Aspect no. 18, 2008, inkjet print, 33x40 cm / 13x16 inch. Unknown Aspect no. 19, 2008, inkjet print, 33x40 cm / 13x16 inch. Unknown Aspect no. 20, 2008, inkjet print, 33x40 cm / 13x16 inch. 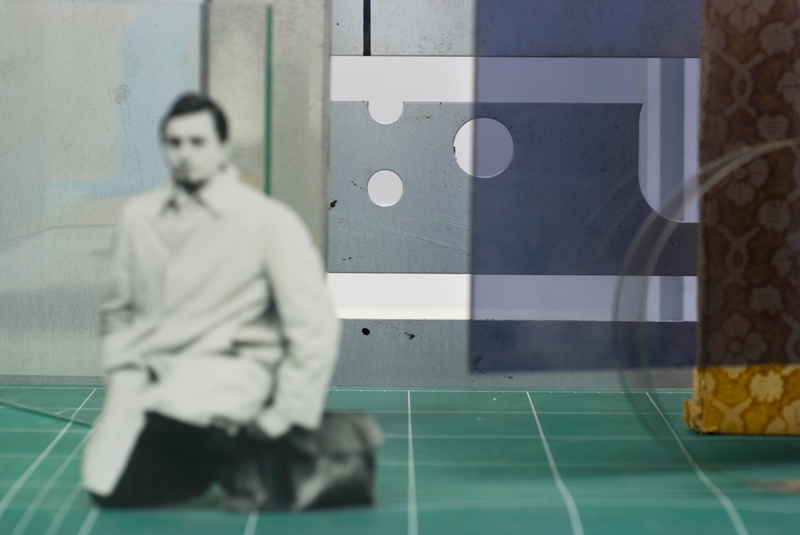 At the Appearance of Things, 2011, inkjet print, 69x109 cm/27 x 43 inch. 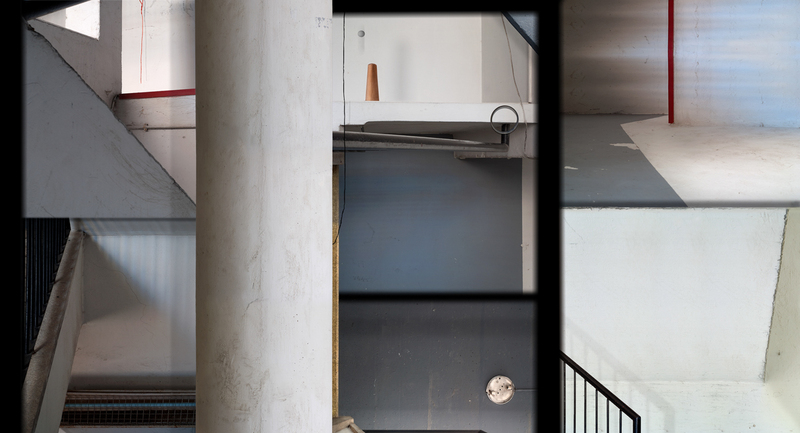 Staircase, 2011, inkjet print, 58x129 cm/23 x 51 inch. 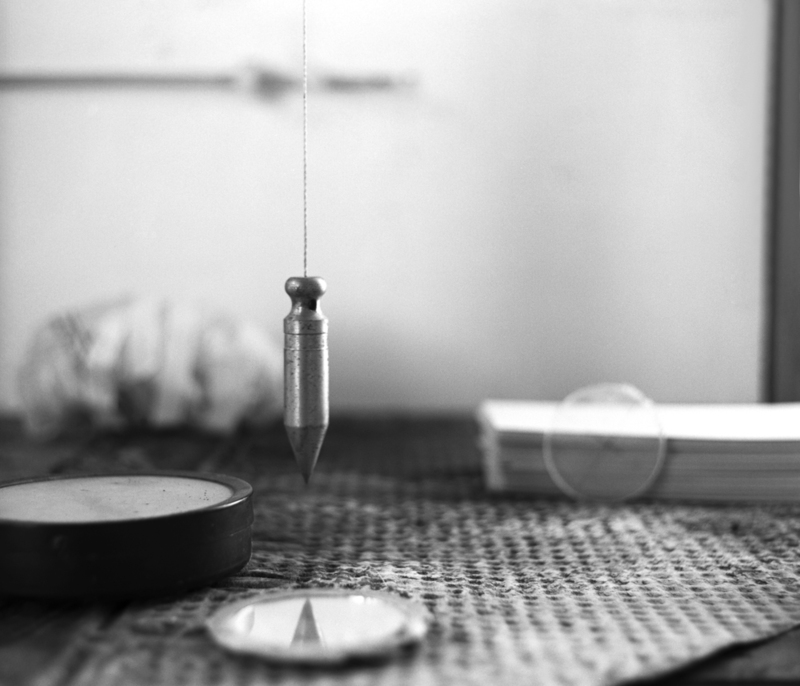 By Mutual Assent, 2012, inkjet print, 68X129 cm / 27 x 51 inch. 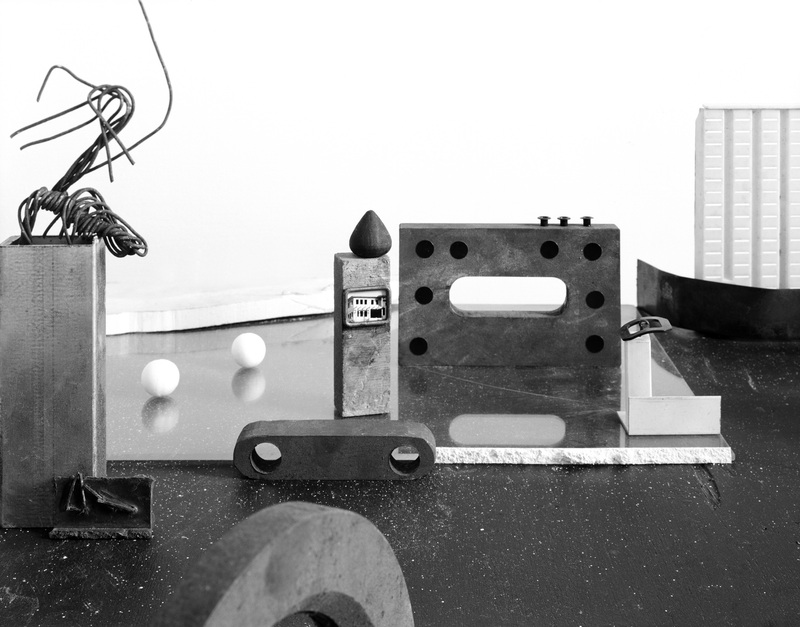 Relative Parts, 2012, inkjet print, 68X125 cm / 27 x 49 inch. 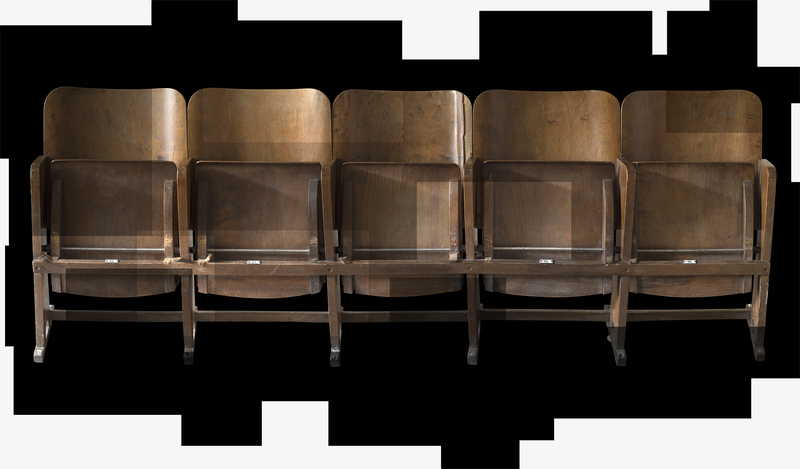 Bidirectional Thought, 2011, inkjet print, 100x153 cm/ 39.5 x 60.25 inch. 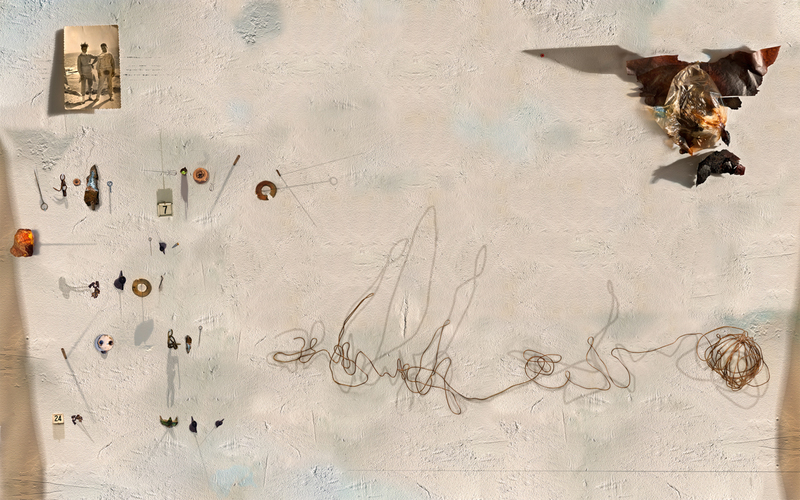 Telegram 24, 2010, inkjet print, 100x160 cm/39.5 x 63 inch. 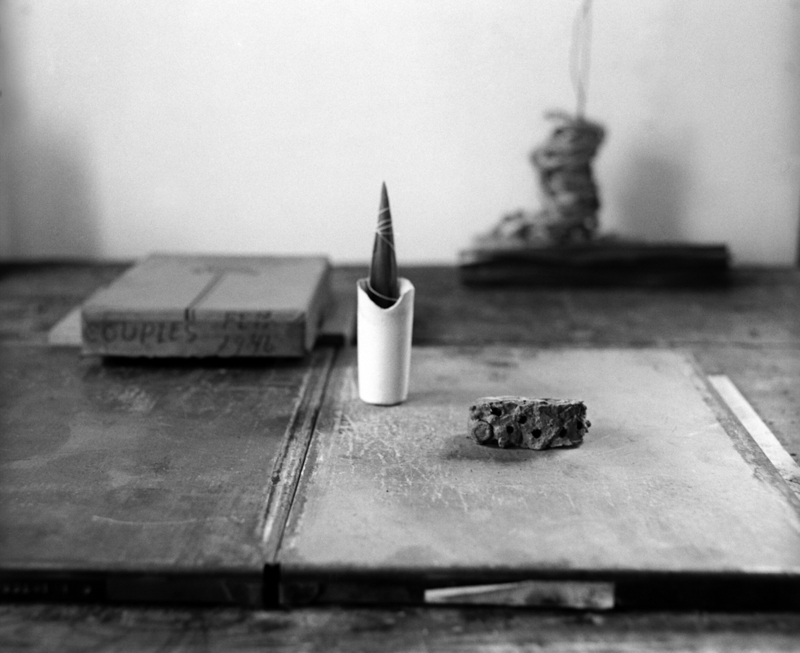 In Ilit Azoulay’s autobiographical work “Horizontal Study” (2012) objects that are all somehow related to the artist’s personal history are placed on a surface resembling a desk. 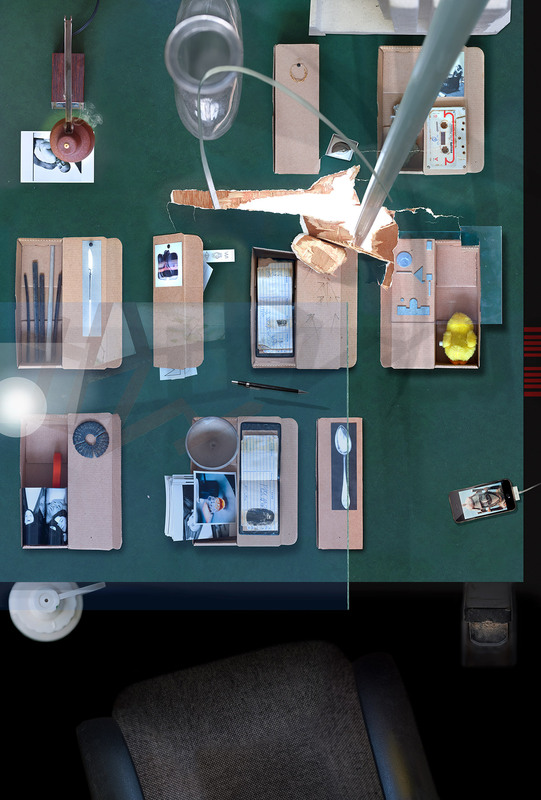 Shot separately from a bird’s-eye view and then composited together digitally, the objects are packaged in nine “Pandora boxes.” Some are open, exposing the objects within them to the camera's prying gaze, while others are sealed, so that the narrative binding the objects together remains an unsolved enigma. 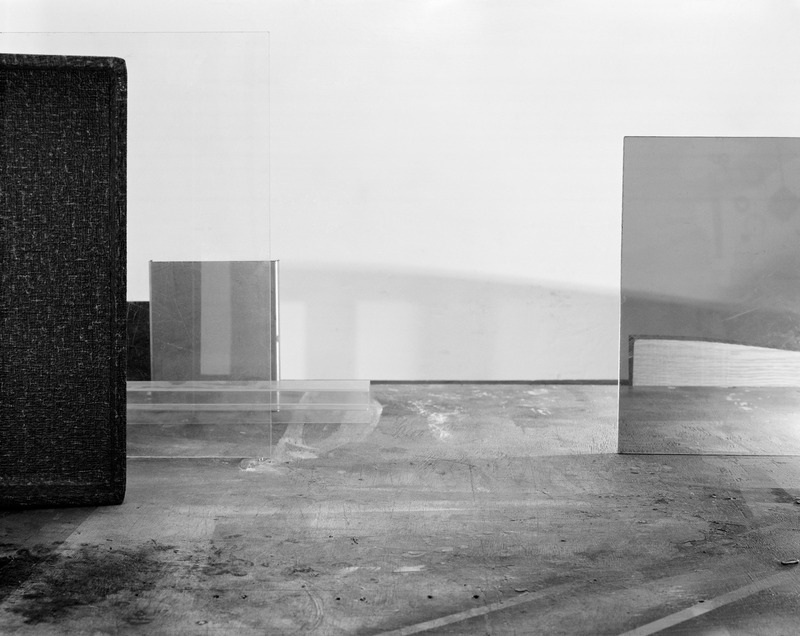 Horizontal Study, 2012, inkjet print, 135x200 cm / 53x79 inch.